Corruption is so pervasive in Nigeria that it has turned public service for many into a kind of criminal enterprise. Graft has fueled political violence, denied millions of Nigerians access to even the most basic health and education services, and reinforced police abuses and other widespread patterns of human rights violations. This report analyzes the most promising effort Nigeria’s government has ever undertaken to fight corruption—the work of its Economic and Financial Crimes Commission (EFCC). Soon after it was established in December 2002, the EFCC began pursuing corruption cases in a way that publicly challenged the ironclad impunity enjoyed by Nigeria’s political elite. Since its inception, the EFCC has arraigned 30 nationally prominent political figures on corruption charges and has recovered, according to the EFCC, some US$11 billion through its efforts. But many of the corruption cases against the political elite have made little progress in the courts: there have been only four convictions to date and those convicted have faced relatively little or no prison time. Other senior political figures who have been widely implicated in corruption have not been prosecuted. At this writing, not a single politician was serving prison time for any of these alleged crimes. Despite its promise, the EFCC has fallen far short of its potential and eight years after its inception is left with a battered reputation and an uncertain record of accomplishment. This report examines the EFCC’s record against high-level corruption and the reasons for its shortcomings. Human Rights Watch believes that in spite of myriad setbacks, a stronger and more independent EFCC represents Nigeria’s most promising avenue to make tangible progress in the fight against corruption in the near future. In large part, this is because the EFCC is the only Nigerian government institution that has posed a meaningful challenge to the impunity enjoyed by corrupt and powerful members of the political elite. This report explains pragmatic steps the Nigerian government can take towards that goal. Most analysis of the EFCC has focused on the commission’s two very different leaders. Nuhu Ribadu, the EFCC’s first head, built the institution into what it is. The media-savvy and dynamic Ribadu regularly and publicly declared war on corrupt politicians. But his legacy was tarnished by evidence that his anti-corruption agenda was selective, dictated at least in part by the political whims of then-president, Olusegun Obasanjo. Ribadu was forced from office just two weeks after he tried to prosecute powerful former Delta State governor James Ibori, a close associate of Obasanjo’s successor in office, Umaru Yar’Adua. Current EFCC chairman, Farida Waziri, who took over in 2008, was brought in to replace Ribadu. Critics allege that, under Waziri, the EFCC’s anti-corruption work has grown timid and lethargic in comparison with Ribadu’s tenure. Many leading activists and political figures have called for her removal and some have accused her of being corrupt. Human Rights Watch believes that the character and capacity of the EFCC’s leadership is an important issue and calls for the allegations that Waziri has proven ineffectual to be investigated. But this report shows that in terms of tangible results, Waziri’s record against high-level corruption is comparable to Ribadu’s, and neither of them can claim much real success. The EFCC has secured only four convictions against nationally prominent political figures—one of those, Lucky Igbinedion, former Edo State governor, was given a sentence so light after pleading guilty that it made a mockery of his conviction. Acts of spectacular incompetence have afflicted the EFCC under both Ribadu and Waziri. Most egregiously, the EFCC under Ribadu failed to appeal a 2007 legally tenuous court ruling that purported to bar the EFCC from investigating alleged crimes by former Rivers State governor Peter Odili. That ruling effectively derailed what could have been the commission’s most important case. Ribadu never publicly explained how or why this happened—and it was on his watch. For her part, Waziri says she has never looked into the reasons why the EFCC allowed that case to be derailed and has made no tangible progress in overturning the ruling in the case. Not all of the EFCC’s failures are its own fault, however. There are enormous institutional hurdles to any honest effort to prosecute corruption in Nigeria. At a fundamental level, Nigeria’s political system continues to reward rather than punish corruption. When ruling party chieftain Olabode George emerged from prison in 2011 after serving a two-and-a-half year sentence following a landmark EFCC prosecution, he was treated to a rapturous welcome by members of Nigeria’s political elite including former president Obasanjo and then-defense minister, Ademola Adetokunbo. The message was unmistakable—proven criminality is no bar to the highest echelons of politics in Nigeria. The courts can also be an obstacle to accountability. Most of the EFCC’s cases against nationally prominent political figures have been stalled in the courts for years without the trials even commencing. Nigeria’s weak and overburdened judiciary offers seemingly endless opportunities for skilled defense lawyers to secure interminable and sometimes frivolous delays. Finally, Nigeria’s other anti-corruption bodies, the Independent Corrupt Practices and Other Related Offences Commission (ICPC) and the Code of Conduct Bureau (CCB), have failed to compliment the efforts of the EFCC. On paper, both institutions have powers that in some ways outstrip those of the EFCC. Unfortunately, they have been ineffectual relative to their size and statutory power and have displayed little appetite for tackling high-level corruption. They need to be empowered with new leadership and prodded to live up to their mandates and complement the EFCC’s own work. In April 2011 Nigeria held national elections. The polls were a significant improvement over previous elections but were still marred by allegations of ballot stuffing, the inflation of results, and election-related violence. Nonetheless, the elections were seen as an important stamp of legitimacy for incumbent president Goodluck Jonathan who until then had been both a state governor and Nigeria’s president without ever winning an election himself. Now it is time for President Jonathan to use his mandate to show that he is serious about breaking with the dysfunction and abuse that have characterized previous administrations. More than anything else, that means tackling corruption in a manner that is both impartial and effective. President Jonathan’s predecessors in office failed to do so. In May 2011 Jonathan signed into law the Freedom of Information Act that guarantees the public the right to access public records—an important step towards improving transparency in Nigeria. Because corruption is at the heart of many of Nigeria’s most serious human rights problems, including access to justice, police brutality, violations of economic and social rights, Human Rights Watch has repeatedly called on the Nigerian government to do more to fight corruption and to bolster the capacity and independence of key anti-corruption institutions—especially the EFCC. This report builds on Human Rights Watch’s past work in Nigeria by examining the EFCC’s record in fighting corruption. It lays out an agenda the Jonathan administration should follow to bolster the EFCC, and other government institutions, to make progress in reducing corruption and its attendant human rights consequences—and they are steps that can and should be taken without delay. The president should publicly state his commitment to break with the bad practices of past administrations in dealing with corruption, including executive branch interference with the EFCC’s operations; sponsor specific legislation to improve the independence of the EFCC; begin the long-term process of repairing and reinforcing Nigeria’s battered federal court system; take specific steps to improve the work of the ICPC and CCB; and investigate allegations of incompetence within the leadership of the EFCC. Nigeria’s international partners also have a role to play. As revealed by diplomatic cables published by WikiLeaks, behind closed doors the United States government took a strong stand against apparent attempts to weaken the EFCC under the Yar’Adua administration. The US government also took the important, albeit belated, step to revoke the visa of former attorney general Michael Aondoakaa who was widely seen as having undermined key corruption cases. Comparable international pressure is needed from all of Nigeria’s bilateral partners to press the Jonathan administration to safeguard the EFCC’s integrity and implement the recommendations in this report. Foreign donors, most notably the European Union, have provided substantial assistance in technical support and capacity building to the EFCC, but Nigeria’s international partners can help in more direct ways as well. Following the example of the United Kingdom in the case of former governor James Ibori, foreign governments should actively pursue corrupt Nigerian politicians who commit financial crimes within their jurisdictions. The EFCC could not successfully prosecute Ibori, but in the end he was not untouchable. In April 2011, the UK government managed to extradite him from Dubai to London where at the time of publication he sat in jail awaiting trial on charges of money laundering. Human Rights Watch has published several reports that examine the links between corruption and Nigeria’s myriad human rights problems. Some of that work has examined the role of the Economic and Financial Crimes Commission (EFCC) in particular. Since 2006 Human Rights Watch has carried out interviews and advocacy with EFCC officials, including Nuhu Ribadu when he was the commission’s chairman. Human Rights Watch also reported extensively on the controversial events surrounding Ribadu’s dismissal from office in 2008. This report draws on that broader foundation and is supplemented by material gathered during a two-week research trip by two Human Rights Watch researchers to Abuja and Lagos in February 2011. During the February trip, researchers carried out in-depth interviews with current and former EFCC officials—both on and off the record—including current chairman, Farida Waziri; officials of the Independent Corrupt Practices and Other Related Offences Commission (ICPC) and the Code of Conduct Bureau (CCB); Central Bank officials; members of the National Assembly with key oversight portfolios; members of the judiciary; lawyers; civil society leaders; and foreign diplomats and donor agency officials. They carried out 32 interviews in total. Human Rights Watch was also able to obtain court documents including judgments, motions on appeal, and transcripts of court proceedings for several EFCC cases against nationally prominent political figures. Those documents inform and in some cases are directly incorporated into Human Rights Watch’s analysis of those cases in the pages that follow. At independence in 1960, many Nigerians believed their country was destined for greatness on the world stage. Instead, more than 50 years on, the country largely remains a “crippled giant.” Corruption has turned what should be one of the country’s strongest assets—its vast oil wealth—into a curse. Rather than lead to concrete improvements in the lives of ordinary Nigerians, oil revenues have fueled political violence, fraudulent elections, police abuses, and other human rights violations, even as living standards have slipped and key public institutions have collapsed. Former Economic and Financial Crimes Commission (EFCC) chairman Nuhu Ribadu has estimated that between independence and the end of military rule in 1999, more than US$380 billion was lost to graft and mismanagement. Endemic corruption has continued since then. Human Rights Watch has documented the role of corruption and mismanagement in depriving Nigerians of their basic human rights in several different contexts. This research showed how in Rivers State—one of Nigeria’s wealthiest states and biggest oil producers—embezzlement and mismanagement of public funds prevented tremendous resources from improving the dire state of basic health and education services during the administration of former president Olusegun Obasanjo. Human Rights Watch has also documented the role of corruption in fueling the political violence and electoral fraud that have plagued Nigeria since the end of military rule. These twin problems have claimed hundreds of lives and produced government institutions that are often ineffective and largely unaccountable to the people who depend on them. For example, Human Rights Watch research shows how corruption has helped transform Nigeria’s national police force from protectors to predators. Widespread bribery and extortion by rank-and-file officers, and a system of “returns” in which bribes are passed up the chain of command, have fueled abuses ranging from arbitrary arrests and unlawful detention to torture and extrajudicial killings. Bribery, embezzlement, and abuse of office by police officials have severely undermined access to justice for ordinary Nigerians and left the force with inadequate resources to carry out meaningful investigations. Corruption is at the heart of many of Nigeria’s most serious human rights problems, and Human Rights Watch has repeatedly called upon the Nigerian government to do more to fight corruption and bolster the capacity and independence of key anti-corruption institutions. This report builds on Human Rights Watch’s past work by examining the EFCC’s record in fighting corruption and making concrete recommendations on how to improve this institution as well as the government’s broader anti-corruption efforts. Following the end of military rule in 1999, and in recognition of the widespread nature of corruption, the Nigerian government established the Independent Corrupt Practices and Other Related Offences Commission (ICPC) in September 2000 to combat public sector graft such as bribery and abuse of office by public officials. The ICPC was intended to build on the Code of Conduct Bureau (CCB), and its sister entity the Code of Conduct Tribunal, which was established in 1990 to enforce a code of conduct for public officials. Neither institution proved effective in curbing rampant public sector corruption. Amid pressure from the international community to address what then-president Olusegun Obasanjo referred to as the “corruption quagmire” in Nigeria, the Nigerian government established the Economic and Financial Crimes Commission (EFCC) in December 2002 with the National Assembly’s passage of the Economic and Financial Crimes Commission (Establishment) Act. The agency, which was granted broad powers to investigate and prosecute economic and financial crimes, was intended primarily as a tool to fight crimes such as money laundering and advance fee fraud. Since its inception, the EFCC has grown into Nigeria’s largest anti-corruption agency, with an annual budget of US$60 million in 2010 and more than 1,700 personnel. The EFCC’s initial caseload reflected its intended focus. The institution proved especially effective in prosecuting cases of advance fee fraud (commonly known in Nigeria as “4-1-9” scams after the relevant provision in the Nigerian Criminal Code)—a crime that includes the pervasive email scams that are widely associated with Nigeria. In December 2005 the EFCC made headlines when it successfully prosecuted the so-called “Brazil” case, involving an advance fee fraud scheme whose Nigerian authors duped a corrupt official at a major Brazilian bank into stealing about $242 million and giving most of it to them. In April 2003, then-president Olusegun Obasanjo appointed Nuhu Ribadu, an assistant commissioner of police, as EFCC’s first executive chairman. Ribadu was a charismatic figure who interacted well with the media and his public profile grew rapidly along with that of the commission’s work. By late 2004, EFCC investigators began pursuing high-profile allegations of public sector corruption. The targets included several of Nigeria’s powerful state governors, and the commission pursued these investigations with considerable fanfare. In 2006, Ribadu famously told the Senate that the EFCC was investigating 31 of the 36 state governors for graft and identified by name some of the governors who would be prosecuted after they left office. Ribadu’s public vows to hold corrupt politicians to account quickly turned him into one of the most recognizable and widely discussed public figures in the country. The EFCC’s investigators developed a reputation for ruthless efficiency, but critics complained that their successes grew from a willingness to flout the law and trample on the rights of suspects. EFCC officials allegedly carried out illegal searches and ignored inconvenient court orders. Some critics, including human rights activists and defense lawyers, complained that the EFCC used Nigeria’s horrible prison conditions as a way to obtain convictions—convincing courts to deny bail applications so that defendants would plead guilty rather than suffer in prison during lengthy trials. Did we break the rules? Yes. You cannot fight corruption and go by the rule of law. Everywhere you look, it’s them. The elite, they have the courts, they have everything.… If you go by the rule of law you won’t achieve anything.… Because of the interest and passion we had, we saw a window and just broke in. The EFCC’s excesses did little to diminish its growing reputation. In 2005 the EFCC successfully prosecuted former inspector general of police Tafa Balogun. He pleaded guilty to failing to declare his assets, his front companies were convicted of money laundering, and the court ordered the seizure of Balogun’s assets, reportedly worth in excess of $150 million. Even though he was only sentenced to six months in prison, the image of such a powerful political figure being hauled before a court in handcuffs stood in stark contrast to the impunity Nigeria’s political elite had come to take for granted. The EFCC’s record soon began to lose its luster, largely because of the apparent political selectivity in its operations. Many of the EFCC’s corruption cases seemed to be pushed forward or derailed according to the political agenda of then-president Obasanjo. Such allegations grew to a crescendo ahead of the 2007 elections, when the agency presented a list of 135 “corrupt” candidates who it said should not run for office. The list was dominated by the president’s adversaries and included none of Obasanjo’s close allies, omitting even the handful of Obasanjo loyalists Ribadu had publicly accused of corruption in the past. It was very obvious … that selectivity was there. Everything was according to the whims and caprices of the president. I believe that. I have always believed that. Obasanjo was so reckless he could have sacked Nuhu [Ribadu] immediately if he went against him, no matter how good his work was. In May 2007 President Obasanjo, along with many of the state governors, left office having reached their constitutionally mandated two-term limit. Ribadu followed through on his earlier pledge and, in July 2007, the EFCC filed corruption charges against a handful of the former state governors, who had lost their immunity from prosecution on leaving office. None of the governors was seen as a close ally of Obasanjo or the new president, Umaru Yar’Adua. But this was soon to change. In December 2007 the EFCC stunned Nigeria by arresting James Ibori, the powerful former governor of Delta State, in the oil-rich Niger Delta. Ibori had presided over a state that had remained impoverished and dysfunctional under his watch despite massive inflows of oil revenue. Although Ibori was not seen as a close ally of Obasanjo, many Nigerians assumed him to be untouchable because of his close relationship to both Yar’Adua—whose campaign Ibori is widely believed to have financially backed—and Yar’Adua’s attorney general, Michael Aondoakaa. The idea that a man as powerful as Ibori could sit in prison awaiting trial gave a momentary new surge of excitement and legitimacy to the EFCC’s anti-corruption campaign (Ibori’s case is discussed in more detail below). When you fight corruption, it fights back. After Ribadu’s abrupt removal from his post at the EFCC in January 2008, the Police Service Commission demoted him by two ranks, and state security agents forcibly removed him from the graduation ceremony at the training course he had been ordered to attend. The police command then ordered him to report for duty at the police zonal office with jurisdiction over Delta State, James Ibori’s home state. Ribadu challenged the legality of his demotion in court, but when he failed to report to his new post, the Police Service Commission dismissed him from the police force. After several death threats and an apparent assassination attempt, Ribadu left the country in January 2009. But his travails were not over. In November 2009 the Code of Conduct Tribunal ordered his arrest on allegations that he had failed to declare his assets. After Goodluck Jonathan was sworn in as president following the death of Yar’Adua from natural causes in May 2010, and Jonathan’s removal of Michael Aondoakaa as attorney general, Ribadu returned to Nigeria. The Police Service Commission, reportedly under pressure from the presidency, restored Ribadu’s rank and reversed his dismissal from the police force, and the new attorney general withdrew the case against Ribadu at the Code of Conduct Tribunal, without any public explanation. In Nigeria’s April 2011 elections, Ribadu stood as the presidential candidate of the opposition Action Congress of Nigeria. He finished a distant third behind incumbent president Goodluck Jonathan and former military dictator Muhammadu Buhari. After a brief interim period under former Ribadu deputy Ibrahim Lamorde, President Yar’Adua appointed Farida Waziri as head of the EFCC in June 2008; she remains in the position at this writing. Waziri’s tenure has been a rocky one. Her many critics allege that she has been ineffective and incompetent; she has also been widely accused of having close relationships with corrupt political figures and of going slow on sensitive cases against powerful political figures. But as the next section of this report details, any comparison of the anti-corruption records of Ribadu and Waziri yields a more complicated picture than Waziri’s critics might expect. Even the EFCC’s critics generally agree that the agency has done a competent job of prosecuting apolitical financial crimes, especially advance fee fraud cases. By March 2011 the EFCC had arraigned some 1,200 people for advance fee fraud, securing so far more than 400 convictions. That side of the EFCC’s work has continued apace under Waziri. Also under Waziri, the EFCC has shed new light on Nigeria’s scandal-ridden banking sector. Central Bank officials told Human Rights Watch that they had received “tremendous cooperation” from Waziri’s EFCC in their efforts to “sanitize the banking industry” and “rid the sector of criminals.” In the most highly publicized of several EFCC banking cases brought under Waziri, former Oceanic Bank managing director Cecilia Ibru was sentenced to six months in prison and disgorged an astonishing 190 billion naira ($1.2 billion) after pleading guilty to several counts of bank fraud in October 2010. The EFCC has made important progress in recovering assets that are the proceeds of crime. According to Waziri, since its inception in 2003, the agency has recovered over $11 billion—of which some $6.5 billion has been recovered since Waziri took office in June 2008, most of which was recovered in the Central Bank’s overhaul of the banking sector. [Under Ribadu] fear of the EFCC was seen as the beginning of wisdom for political office holders and you could see the impact. Corruption was not eradicated but people looked over their shoulders before carrying out their corrupt activities. The question is: is that feeling still there today? That’s where you can draw the line between the EFCC then and the EFCC today. Perception is important—if people believe a policeman will chase them, they are less likely to commit a crime. There was a perception of efficiency, of the EFCC being active.… I haven’t seen that today. One cannot say that fear is there any longer. Much of what has been said about Ribadu’s tenure at the EFCC has been largely [based on] perception rather than reality.… Ribadu was hailed because of his Gestapo tactics in bringing suspects to court. He handcuffed the suspects, sometimes they dragged them on the floor.… That is all [people] remember, but it’s bereft of statistics. The statistics are not so much different on both sides [Ribadu or Waziri].… So most of it has been all noise and no record to back it up. Human Rights Watch has long argued that the most important measure of Nigeria’s anti-corruption record is its success or failure in prosecuting corrupt nationally prominent political figures. Corruption by high-level officials such as state governors who control vast financial resources directly impedes the provision of adequate health and education to Nigerians by diverting the resources that might otherwise flow to basic services. In a broader sense, high-level corruption in Nigeria is so widespread and so central to the day-to-day workings of government that it undermines the effectiveness of public institutions at all levels, from the national police to local government primary education authorities. By the same token, Human Rights Watch believes that the EFCC’s public challenge to the impunity enjoyed by abusive members of Nigeria’s political elite has been its most important accomplishment in the fight against corruption. Only by holding prominent officials to account for corruption can Nigeria’s government show that corruption will not be tolerated, and discourage officials at all levels from stealing public funds the country needs to provide for basic needs. The following pages examine the relative performances of the EFCC under Ribadu and Waziri in pursuing those prosecutions. For the purposes of this report, Human Rights Watch considers “nationally prominent political figures” to include current or former state governors, federal government ministers, and members of the federal Senate or House of Representatives, as well as a handful of other political figures who can without any controversy be described as nationally prominent. At various times, Ribadu publicly claimed to be pursing investigations against an endless parade of important public officials. These public statements generated continual headlines and contributed to an impression that the agency was fighting corruption on a thousand fronts at once. But in reality, the EFCC’s attempts to prosecute nationally prominent political figures have been characterized primarily by delay, frustration and failure—under both Ribadu and Waziri. The cases have generated far more headlines than convictions, and neither Ribadu nor Waziri can claim more than a handful of concrete successes. Waziri argued that the number of important cases she has filed compares favorably with Ribadu’s own record. And in terms of raw numbers, she has a point. As the charts below show, the number of prosecutions targeting allegedly corrupt nationally prominent public officials is higher under Waziri (16 cases) than Ribadu (10 cases). There are at least two important caveats to this assessment. First, much of the investigation and other legwork for some of Waziri’s initial prosecutions was done before she took the helm. A review of her record shows that there has been a significant drop in the number of new cases after those initial prosecutions. For example, during Waziri’s first year in office, the EFCC arraigned 10 nationally prominent political figures on corruption charges compared to just six in her next two years combined. On the other hand, in June 2011, Waziri stated that investigations against nine other former governors were at an “advanced stage.” Second, the EFCC’s funding has tripled since 2007—its annual budget grew from approximately $23 million in 2007 to $60 million in 2010, without a commensurate increase in the rate of new prosecutions. In terms of pure numbers, the sum total of the EFCC’s convictions of nationally prominent political figures is underwhelming: a mere four convictions in eight years—between 2003 and July 2011. Only one of the four convictions was obtained at trial, with the others obtained through plea bargains that involved dropping some of the most serious charges against the accused. Ribadu was no more successful in convicting nationally prominent political figures than Waziri has been, and both of the EFCC’s convictions under Ribadu were through plea bargain agreements. The one caveat is that seven of the cases against former state governors filed under Ribadu, and a number of the cases brought by Waizri, have been stalled in the courts by procedural delays and may yet result in important convictions. Tafa Balogun was the EFCC’s first conviction of a nationally prominent political figure. Charged to court in April 2005, just months after being forced to retire as Nigeria’s inspector general of police, Balogun ultimately pleaded guilty of failing to declare his assets, and his front companies were convicted of eight counts of money laundering. In December 2005 he was sentenced to six months in prison and the court ordered the seizure of his assets—reportedly worth in excess of $150 million. The sentence struck many as light given the severity of the allegations—he stood accused of financial crimes allegedly committed at a time when he was serving as Nigeria’s chief law enforcement officer. Nonetheless, Balogun’s conviction was a profoundly important moment—the sight of such a prominent public official being hauled before a court in handcuffs to answer for corruption was something many Nigerians had thought impossible. Balogun has since reportedly retired to a luxury home in a high-end Lagos neighborhood. Diepreye Alamieyeseigha served as governor of Nigeria’s oil-rich but deeply impoverished Bayelsa State from 1999 to 2005. In September 2005, he was arrested by British authorities in London. The London Metropolitan Police found about £1 million in cash at his home and charged him with money laundering. Released on bail, Alamieyeseigha managed to flee the UK—the EFCC says disguised as a woman—and reappeared in his home state, claiming he had been transported there by God. As a sitting governor he enjoyed immunity from prosecution in Nigeria, but three months later he was impeached by his state legislature, and the EFCC charged him with embezzling about $55 million in public funds. In July 2007 the former governor pleaded guilty to failing to declare his assets, his front companies were convicted of money laundering, and the court ordered his assets seized. He was sentenced to two years in prison and released, for time served, the day after his sentencing. Alamieyeseigha was quickly welcomed back into the ruling party fold. In May 2008 senior ruling party officials openly campaigned alongside Alamieyeseigha at a political rally in Bayelsa State, just 10 months after his conviction. Former Edo State governor Lucky Igbinedion was charged by EFCC prosecutors in January 2008 with siphoning off more than $25 million of public funds. He ultimately pleaded guilty in December 2008 to failing to declare his assets and his front company was convicted on 27 counts of money laundering. But the trial judge in the case, Abdullahi Kafarati, deviated from the terms of the plea agreement and handed down a very light sentence that included no jail time (this aspect of the case is discussed in more detail below). Igbinedion paid the equivalent of a $25,000 fine, agreed to forfeit some of his property, and walked free on the spot. The EFCC appealed the light sentence. In early 2011, the EFCC raided two of his palatial homes in Abuja and filed new criminal charges against the former governor. But in May 2011 the court dismissed the case, ruling that the new charges would amount to double jeopardy. Olabode (“Bode”) George was a powerful figure within the ruling party under President Obasanjo and was also chairman of the Nigerian Ports Authority (NPA) for a time. The EFCC in August 2008 charged him with contract-related offenses dating back to his time at the NPA. In October 2009 he was convicted and sentenced to two and a half years in prison after a surprisingly swift and efficient trial. This was the EFCC’s first and so far only conviction at trial of a major political figure—an important accomplishment. The positive example of his conviction was diminished, however, when he was treated to a rapturous welcome by key ruling party figures upon his release from prison in February 2011. The EFCC has made some promising steps in tackling deeply entrenched impunity for political corruption in Nigeria. At this writing, 30 nationally prominent political figures had been arraigned by the EFCC on corruption charges in the eight years since the agency was established. But many of these cases have made little progress in the courts; there have been only four convictions to date and those convicted have faced relatively little or no prison time, and other senior political figures who have been widely implicated in corruption have not been prosecuted. The performance of the EFCC is continually undermined both by institutional factors beyond its control and failures of the commission’s own making. The following pages describe what Human Rights Watch believes to be the most important impediments to the EFCC’s anti-corruption work, both systemic and self-inflicted. If a law enforcement officer wants the work to be done, it will be done. But he may be denigrated, isolated, treated like a deviant. In Nigeria, crime does pay. Those doing this work are cut off from the system and are very unpopular among our colleagues and even in public opinion. The broadest obstacle any effort to tackle corruption in Nigeria faces is this: the country’s political system is built to reward corruption, not punish it. Too often, corruption is a prerequisite for success in Nigeria’s warped political process. Since 1999, elections have been stolen more often than won, and many politicians owe their illicitly-obtained offices to political sponsors who demand financial “returns” that can only be raised through corruption. Put simply, the day-to-day functioning of Nigeria’s political system constantly and directly undermines the EFCC’s work. Powerful ruling party power-broker and former Nigerian Ports Authority chairman Olabode (“Bode”) George was sentenced to two and a half years in prison for contract-related offenses in 2009. His conviction after a swift and efficient trial was in many ways a landmark success for the EFCC. But his case is also an example of the willingness of Nigeria’s political establishment to embrace convicted criminals. Bode George was released from prison in February 2011. Far from being treated as a pariah because of his misdeeds, he was whisked from his jail cell to a lavish welcome ceremony attended by prominent ruling party politicians including former President Obasanjo, then-Ogun State governor Gbenga Daniel, and then-minister of defense Ademola Adetokunbo. According to media reports, a former transportation minister even declared that George’s conviction had been unfair because all government officials engage in the same illegal practices he had been convicted of. Nigeria watched the ruling party establishment, including a sitting cabinet minister from the same administration that supposedly backs the EFCC’s anti-corruption agenda, welcome Bode George back into its arms as though he were a conquering hero rather than a convicted criminal. Meanwhile, the Lagos State judge who sent Bode George to prison was removed from criminal matters and sent to work in family court. While there is no proof that the move was connected to George’s conviction, many Nigerian activists and commentators found it hard to believe it was a coincidence. Bode George’s story is not an anomaly. Ten months after former Bayelsa State governor Diepreye Alamieyeseigha was convicted on corruption charges, Goodluck Jonathan, who was vice president at the time, and late president Yar’Adua openly campaigned alongside Alamieyeseigha in May 2008 at a political rally in Bayelsa State. These images of senior government officials embracing convicted criminals only served to reinforce the broader trend of impunity that these convictions were meant to push back against. Nigeria’s political establishment, both the ruling party and leading opposition parties, openly welcome into their ranks politicians accused of corruption. Joshua Dariye and Abdullahi Adamu, former state governors of Plateau and Nasarawa, respectively, have both been arraigned by the EFCC on corruption charges but won elections to the Senate in the April 2011 elections. Two of the legislators awaiting trial on corruption charges—Igwe Paulinus and Ndudi Elumelu—also won their elections to seats in the House of Representatives. Eight other former governors arraigned on corruption charges by the EFCC won party nominations to stand in the 2011 elections, either for governor or senator. In a purely structural sense the EFCC is deeply vulnerable to the whims of the presidency. The commission’s chairman enjoys no security of tenure and can be removed by the president at will, without any form of consultation or approval from the National Assembly. And the political pressures brought to bear on the EFCC have at times been enormous. The background section of this report described how allegations of political selectivity tarnished the EFCC’s reputation when President Obasanjo was in power, and how Ribadu’s attempt to prosecute James Ibori led to his removal from the commission. After Ribadu’s ouster, the attorney general at the time, Michael Aondoakaa—reportedly Ibori’s close associate—seemed bent on undermining the very notion of a government-led war on corruption (see text box below). Michael Aondoakaa was attorney general in the Yar’Adua administration from July 2007 to February 2010. He was also reportedly a close associate of James Ibori, the disgraced former governor of oil-rich Delta State in the Niger Delta. During his time in office, Aondoakaa worked openly to undermine the independence of the EFCC and to derail domestic and international efforts to bring Ibori to justice. His strong-arm tactics earned him considerable notoriety. According to Ribadu, Aondoakaa “interfered” in many of the EFCC prosecutions and “destroyed cases relating to corrupt State Governors [by] discontinuing hearings and trials.” According to leaked US State Department cables published by WikiLeaks in 2011, in 2008 Waziri told the US ambassador in Abuja that Aondoakaa had taken complete control over the EFCC’s case against Ibori along with other “politically sensitive” cases—something the attorney general technically had no clear power to do without formally removing the cases from the EFCC’s purview. In one such instance, one of the lawyers working on the Ibori case told Human Rights Watch that after the EFCC appealed a decision by the Court of Appeal transferring the case to Ibori’s home state—where Ibori still wielded enormous influence—the attorney general ordered the EFCC to withdraw the appeal. Waziri even implored the US ambassador to “put pressure on” the attorney general to allow her to move the Ibori case forward. Aondoakaa is also alleged to have interfered in the money laundering case against Ibori and his associates in the United Kingdom. After an English court froze $35 million of Ibori’s assets in August 2007, Aondoakaa provided Ibori’s lawyer with a letter stating that Ibori had been “investigated” in Nigeria and no charges had been filed, despite the fact that the EFCC was still investigating the case and finalizing criminal charges. The letter led the English court to lift the freeze on Ibori’s assets. According to leaked US State Department cables, Aondoakaa also refused to negotiate a broad prisoner transfer agreement with British authorities unless the UK dropped efforts to prosecute Ibori for money laundering. The US government revoked Aondoakaa’s US visa in 2010 due to his “links to corruption,” but despite the wealth of evidence they had of his corrupt activities, they only took this action after he had left office. You don’t go picking [arresting] a high-profile serving government official without clearing from the president. Whoever is the EFCC chairman, he can’t go beyond the wish of the president. If he does, he would be removed the next day.… At the end of the day, anyone who is the chairman of the EFCC will have to read the body language of Mr. President to do what he wants. This kind of alleged political interference is a problem for other anti-corruption institutions as well. In January 2011 Attorney General Mohammed Adoke announced that he was taking over a rare high-profile ICPC corruption case against the deputy health minister Suleiman Bello, without offering any explanation for the move. “We brought the case and the attorney general just told us to drop it,” one ICPC official told Human Rights Watch. The attorney general has the power to take over or discontinue any prosecution from another federal agency if he believes it to be in the interest of justice. In this case, the attorney general’s failure to provide any rationale for the move sparked widespread concern that his real aim was simply to quash the case. The EFCC Act grants jurisdiction to both federal and state courts to try EFCC cases. According to the EFCC Act, special judges or courts should be designated to hear corruption cases, and these proceedings should be “conducted with dispatch and given accelerated hearing.” Despite these provisions, many of the EFCC’s cases have made little progress in the courts. Of the EFCC’s 12 ongoing prosecutions of former state governors, eight have already been dragged out for more than three years. Some have gone more than four years without a single witness being called at trial. With the exception of the Lagos State court system, no other state courts or judges in the federal system are designated to hear the corruption cases—and even in Lagos State the designated judges still have to hear cases involving other matters on their docket. Most Nigerian courts are burdened with an antiquated physical and legal infrastructure that renders them extremely slow and inefficient. With the notable exception of the Lagos State court system, rules of evidence and procedure have for the most part been left practically untouched since colonial rule, with absurd results—most state courts, for example, still lack a formal mechanism to admit electronic documents into evidence. Many judges must take their own notes in longhand while, in the words of one judge, they “sweat and choke” in stiflingly hot courtrooms—hobbling the speed of any proceedings. The judiciary, including appellate courts, also strains under the burdens of an excessive caseload. These and other factors conspire to create extraordinary delays. As one lawyer told Human Rights Watch, “Overworked judges want the opportunity to put off their work, so you get adjournments for the asking—and it always then takes about one to three months at least [to return to court] because the court’s calendar is always full.” But the most extreme delays come from the court system’s backlog of appeal cases. Many judges halt trials while interlocutory appeals are decided by higher courts, and skilled defense lawyers can exploit this to generate months or even years of delays in any given case. When former Kogi State governor Abubakar Audu sought a court order restraining the EFCC from prosecuting him in 2006, Federal High Court judge Mohammed Liman denied the application, noting that “I cannot be but horrified by the level of debauchery that was alleged to have been committed,” and he questioned the propriety of the former governor’s attempts to “use the instrumentality of the law to prevent his coming face to face with justice.” But since being charged, Audu’s case has been crippled by interminable delays. In early 2011, after nearly five years of appeals and other stoppages, the trial was finally expected to commence—only to be postponed yet again when Audu was granted a delay for medical reasons. Critics doubted how ill the accused truly was; having declared his candidacy to regain the governorship of Kogi State, Audu was vigorously campaigning in spite of his infirmity. I will advise my client not to rush to judgment.… The laws are skewed in favor of an accused person … once he’s granted bail he can drag out his trial forever. This is compounded by the fact that judges are bombarded with work, have no modern facilities, and no good assistance. In September 2004, British authorities in London arrested Plateau State governor Joshua Dariye on allegations of money laundering and seized about £90,000 in cash. Dariye skipped bail, fled to Nigeria and reassumed his office—which granted him immunity from prosecution. An English court in April 2007, however, sentenced Dariye’s associate to three years in prison for laundering more than £1.4 million of public funds found to have been stolen by the governor. Once the governor’s term ended in 2007, the EFCC quickly moved to charge him with 14 counts of money laundering. But four years later, Dariye remains free and at this writing his trial had yet to begin. The EFCC’s frustrated effort to prosecute him is a perfect case study of the Nigerian courts’ ability to generate delays so extreme that they are almost a form of impunity. Soon after he was charged, the Federal High Court granted Dariye bail even though he had fled prosecution while out on bail in the UK. In November 2007 Dariye’s lawyers then filed a motion asking that all of the charges against him be dismissed. Justice Adebukola Banjoko denied the motion, but Dariye’s lawyers appealed the ruling. Banjoko halted the proceedings until Dariye’s appeal could be heard. The Court of Appeal ruled against Dariye on every issue, but by the time that ruling was handed down in June 2010, nearly three years had passed since Dariye had first been hauled into court. In December 2010 Dariye was back before the trial court and Banjoko stated that his trial would finally commence in January 2011. But Dariye’s lawyer immediately stood up to announce that he had filed an appeal of the Court of Appeal’s ruling with the Supreme Court. The court subsequently halted the proceedings again until that appeal could be heard. Rotimi Jacobs, one of the EFCC’s outside counsel on the case, told Human Rights Watch that given the backlog of cases faced by the Supreme Court, he thought the trial might not actually begin until sometime in 2013. In April 2011 Dariye won election to the Senate; at the rate his trial has progressed so far, he might serve out his entire term before a final verdict is rendered in his case. These delays are not all inevitable. Section 40 of the EFCC Act purports to foster speedier trials in EFCC cases by barring judges from stopping trials to wait for appeals to be decided. In theory, this provision is one of the most potent procedural weapons the EFCC has at its disposal. But EFCC officials say that many judges have simply refused to adhere to section 40, viewing their wide discretion to decide such matters as a constitutional guarantee that cannot be curtailed by legislation. The EFCC Act also grants trial judges broad powers to take appropriate measures to ensure speedy trials and avoid delays in EFCC cases, but with some exceptions the courts have not made any apparent use of those powers. The EFCC, under both Ribadu and Waziri, has opposed bail in virtually all the corruption cases, but unlike the early cases brought by Ribadu, the courts now grant the accused bail. At this writing, of the 24 cases of nationally prominent political figures awaiting trial, all of the accused were free on bail. The former governors have tremendous leverage over the system. I don’t know if they had judges in their pockets, but I do know the system was on their side. Courts in Nigeria have stood up to roll back abuses of government power more frequently and effectively than any other institution. For example, courts stripped 12 ruling party governors of their seats after Nigeria’s fraud-riddled 2007 elections. But Nigeria’s vast judiciary is a mixed bag, and some courts have been tainted by allegations of corruption or succumbing to political influence. For example, the reputation of Nigeria’s court system took a beating in February 2011 when Ayo Salami, the president of the federal Court of Appeal, publicly accused Supreme Court chief justice, Aloysius Katsina-Alu, of trying to pressure him to decide a key electoral petition in favor of the ruling party. It did not help matters that Mary Odili, wife of notorious and allegedly corrupt former Rivers State governor Peter Odili, was elevated to a Supreme Court seat the same month. Not long after, leaked US State Department cables revealed that Dimeji Bankole, at that time Speaker of Nigeria’s House of Representatives, claimed to US diplomats he had proof Supreme Court justices had taken bribes to validate Umaru Yar’Adua’s election as president in 2007. More recently, in the run-up to Nigeria’s 2011 polls, lower court judges handed out an unprecedented number of election-related injunctions to various candidates for office. The blizzard of injunctions was so dense that many critics suspected some judges were essentially offering them up for sale. The temptation to give in to graft is especially high in cases involving wealthy political figures on trial for corruption. Human Rights Watch has not seen concrete evidence of judicial corruption in any of the EFCC cases, but there are at least three high-profile EFCC cases where the appearance of judicial impropriety has been striking. In March 2007 then-Rivers State governor, Peter Odili, obtained a remarkable Federal High Court decision forbidding the EFCC from investigating the finances of his government. After Odili left office, he managed to secure a “perpetual injunction”—widely condemned as a mockery of the judicial process—that permanently restrained the EFCC from “arresting, detaining and arraigning Odili on the basis of his tenure as governor.” The decision was widely denounced as without any legal basis and its author, Justice Ibrahim Buba, became a widely reviled figure in the Nigerian press. The Odili case, which the EFCC bungled in spectacular fashion, is discussed in more detail below. In December 2008, EFCC prosecutors reached a plea bargain agreement in the trial of former Edo State governor Lucky Igbinedion, who was charged with various counts of money laundering involving about $25million in state government money. According to attorney Rotimi Jacobs, who prosecuted the case, the agreement stipulated that Igbinedion would plead guilty to several counts, and the judge would sentence him to at least six months in prison and order the former governor to forfeit three illicitly-acquired Abuja properties. Still more jarring was a federal judge’s December 2009 dismissal of all 170 criminal counts against powerful former Delta State governor James Ibori—without allowing the prosecution to present any of its evidence at trial. The case was heard in Asaba—capital of Ibori’s home state—after the former governor’s lawyers won a court order that overturned established precedent by moving the trial there from Kaduna. In dismissing the charges against Ibori, Federal High Court judge Marcel Awokulehin held that despite submitting over 1,000 pages of documentation, the prosecution had failed to establish a prima facie case of even one instance of criminal wrongdoing by Ibori or his six co-defendants. Considering the allegations at issue, the decision was baffling. One count of the indictment alleged that Ibori had given then-EFCC chairman, Ribadu, a $15 million bribe in an attempt to get the case against him dropped. Ribadu had handed $15 million in cash over to the Central Bank of Nigeria for safekeeping as evidence, alleging that this was the money Ibori had bribed him with. Ribadu claimed that Ibori arranged for him to collect the money at the home of powerful People’s Democratic Party (PDP) politician Andy Uba. The prosecution presented the court with witness statements by Ribadu and two other EFCC officials alleging that they went to Uba’s house and collected the money as instructed. But Justice Awokulehin held that the prosecution’s case on this count would inevitably consist entirely of “worthless hearsay evidence” because Uba had not provided them with a written statement confirming that he had tried to bribe Ribadu at Ibori’s request. In February 2011 Central Bank officials confirmed to Human Rights Watch that Ribadu had given the Central Bank the $15 million and that it remained in their possession. The EFCC has since appealed Justice Awokulehin’s dismissal of the case. We were talking and engaging with James [Ibori] throughout the investigation. He stated that he wanted to give me money to stop the investigation. I wanted to make him feel comfortable, so I did not refuse his offer.… He did not want to come to our offices and I didn’t want to go to his house and I did not want to him to come to my house. He stated that he would make the money available to me at Andy Uba’s house in Abuja. At the time Andy Uba was Special Advisor to President Obasanjo. I briefed my colleagues at the EFCC, about everything that was going on. On the day that James said that he was going to give me the money, I told my colleagues and we went to Andy Uba’s house. My staff on that occasion would have included EFCC Head of Operations, Ibrahim Lamorde and EFCC Head of Unit and EFCC Officer James Garba. James (Ibori) was there and his servant or diver brought out the money from the house, in two (2) massive sacks containing US$100 dollar bills. My staff took possession of the money.… I told my staff to take the money to the Central Bank of Nigeria (CBN) directly that same afternoon, where it was counted and lodged as an exhibit. The total amount that James gave me was exactly US$15 million. James was not aware that the money had been taken to the CBN, I was of the view that James thought that I had taken it personally and possibly shared it with my own staff. At the time that he gave me the money James was immune from prosecution, so I could not arrest him. I did not tell him that I had banked the money, because I did not want him to flee the country. The first time that he would have realized that the bribe had not been successful was when he was arrested. The EFCC has filed more than 25 complaints against judges for various delays in the corruption cases, granting “frivolous injunctions to halt trials and investigations,” and “partisanship”—including to the National Judicial Council, an independent constitutional body responsible for oversight and discipline of members of the judiciary—but, according to the EFCC, little has been done other than, in a few cases reassigning the case to a new judge. The Peter Odili Case: Gross Incompetence or Worse? The EFCC’s failure to prosecute former Rivers State governor Peter Odili (in office from 1999 to 2007) stems from severe incompetence for which officials have failed to offer any plausible explanation. Odili was a close ally of former president Olusegun Obasanjo. His tenure in office was marred by widespread evidence of corruption, mismanagement, organized political violence, and electoral fraud. By 2006, then-chairman Ribadu told Human Rights Watch that the EFCC had amassed a vast criminal case against Odili. And in 2007 Ribadu reportedly helped derail Odili’s vice-presidential ambitions by presenting some of that evidence to Obasanjo in a dossier that detailed evidence of fraud and corruption against Odili. However, the EFCC has never charged him. According to legal experts interviewed by Human Rights Watch, the EFCC had two clear options: appeal the ruling, or simply proceed to charge Odili to court and then argue that Buba’s ruling was of no validity if Odili sought to raise it as a defense. Instead, the agency did absolutely nothing and effectively let the investigation die. In March 2008, “for the avoidance of doubt,” Buba issued an order that the EFCC could not “arrest, detain, arraign and/or prosecute [Odili] on the basis of its alleged investigations into the affairs of Rivers State” during Odili’s tenure, and declared that the “purported findings” of the EFCC’s investigations were “invalid, unlawful, unconstitutional, null and void.” For good measure, the judge also barred the EFCC from publicizing or disseminating the findings of the investigation Buba purported to throw out. Although the EFCC in March 2008 publicly stated that it had completed its investigation into Odili’s “wanton looting of the treasury of Rivers State” and was ready to arraign him on corruption charges, the commission failed to appeal this injunction as well. Ribadu, who was still head of the EFCC when the 2007 judgment was handed down, has never publicly explained why he did not fight Buba’s ruling. Ibrahim Lamorde, who was interim chair of the EFCC when Buba handed down the 2008 injunction, has never publicly explained why he did not contest that either. When asked whether she had looked into the reasons for the EFCC’s inexplicable failures on the Odili case, current chairman Waziri said only, “I really, really don’t know what happened then.” Another EFCC official claimed to Human Rights Watch that through some unexplained error, the EFCC was never even aware that the 2008 injunction had been issued until the time to appeal it had expired. “I don’t know what happened,” the source said. “By the time we went to court it was late or something.” These professions of total ignorance are hard to fathom considering that this was one of the EFCC’s most important cases. In February 2011 Waziri told Human Rights Watch that the EFCC’s criminal case against Odili is strong enough to take to court and is held back only by Buba’s ruling. The agency has retained outside lawyer Ado Balarabe Mahmoud to try and overturn it. The EFCC appealed Buba’s 2007 judgment in October 2008, but at this writing it had not yet been heard by the federal Court of Appeal. The treatment of some key Ribadu’s deputies smacked of retribution, however. Ibrahim Magu, the former head of the Economic Governance Unit—responsible for all of the EFCC’s cases against political figures—was locked in a cell in the basement of police headquarters for nearly three weeks in August 2008, accused of failing to hand over documents relating to key prosecutions. Several other officers were redeployed by the police to remote postings where none of their considerable investigative skills would likely be put to use. A few were posted to states whose governors they had personally investigated for corruption and still wielded enormous power. By August 2008, the US government had become worried enough to send the Yar’Adua administration a written demarche expressing concerns about the state of the EFCC and asserting that the institution had “turned out to be a disappointment.” In March 2009, Nigeria’s foreign minister tried to arrange a surprise meeting between the EFCC chairman and the US ambassador by inviting Waziri to what had been billed as a one-on-one lunch with the ambassador at his home. This was an attempted end-run around the US government policy of expressing its alarm at the state of the EFCC, and Waziri’s record as chairman, by refusing to grant her high-level meetings. The ambassador threatened to walk out, and the foreign minister agreed to tell Waziri that she would have to go. In December 2010 many observers were surprised when Ibrahim Lamorde—a prominent former Ribadu deputy—was brought back to the EFCC as director of operations. The move was widely seen as a prelude to Waziri’s ouster and replacement by Lamorde, but as of the time of writing Waziri remained in office. Waziri’s reputation has been further damaged by widespread rumors that under her watch, EFCC operatives have themselves become increasingly implicated in corrupt practices and extortion of criminal suspects and victims alike. Human Rights Watch has seen no concrete evidence of this alleged wrongdoing, however. For example, Rabe Nasir, former head of the House of Representative committee that oversees the EFCC, alleged that there is “pervasive corruption” in Waziri’s EFCC. As examples he cited having received numerous petitions from fraud victims who explained how they had approached the EFCC for help only to have its operatives demand a large cut of any assets ultimately recovered. He declined to provide these petitions to Human Rights Watch, however, or to explain what he intended to do with the information. Leaked US State Department cables reveal that from the beginning, US embassy personnel were suspicious of Waziri’s “questionable ties” to leading political figures who stood accused of corruption. In response to US government concerns about the influence of allegedly corrupt former governors and other officials over the Yar’Adua administration, Waziri claimed not to know who the US embassy was referring to. The US embassy viewed this claim as “truly remarkable” and “not credible” given that the influence wielded by James Ibori and other controversial political figures was public knowledge at the time. Deteriorating international perceptions of Waziri were reflected in the US embassy’s classified assessment of her as a “minor tool” in larger, shadowy political machinations. The Independent Corrupt Practices and Other Related Offences Commission (ICPC) and the Code of Conduct Bureau (CCB)—the two other federal institutions specifically tasked with fighting corruption—have been widely criticized as ineffectual. Their shortcomings are important—both institutions have powers and resources that in some ways outstrip those of the EFCC and could be very potent weapons in the fight against corruption. If both were functioning properly and had the right leadership in place, they could greatly bolster the EFCC’s anti-corruption work and perhaps even take the leading role. The ICPC—not the EFCC—was originally meant to be Nigeria’s primary institution to address corruption in the public sector. But in a public opinion poll of Nigerians in 2008, only 16 percent of respondents named the ICPC as the anti-corruption agency that first came to their mind—compared to 81 percent of respondents who named the EFCC. Created in 2000 with the National Assembly’s passage of the Corrupt Practices and other Related Offences Act, the ICPC has broader powers than the EFCC to fight public sector corruption and is more insulated from the dictates of the presidency. For example, the ICPC has broader powers than the EFCC to seize the assets of allegedly corrupt public officials and compel production of financial information. The ICPC can even compel public officials to explain how they acquired property that its investigators deem “excessive” in relation to their salaries—a power that has no parallel in the EFCC Act. And as discussed in detail below, the ICPC’s chairman is better protected from presidential pressure than his counterpart at the EFCC because he enjoys security of tenure. The ICPC, with an annual budget of approximately $12.3 million in 2010 and some 500 personnel in 11 offices across Nigeria, has had some successes, but the institution is widely regarded as ineffective in spite of its broad powers and has shown little appetite for high-level corruption cases. Since 2000, the agency has arraigned 520 people on various corruption charges and secured 25 convictions. But only 10 of the defendants were nationally prominent political figures. Out of those cases, seven defendants—charged in 2005—died or had their case dismissed; two of the trials, at this writing, had not yet begun; and only one case had resulted in a conviction. In June 2010, former chairman of the National Drug Law Enforcement Agency Bello Lafiaji was sentenced to four years in prison on seven counts of financial crimes, including taking €164,300 to release a suspect arrested on drug charges. Senator Sola Akinyede, chairman of the Senate committee that oversees both the ICPC and EFCC, told Human Rights Watch that the institution makes no use of its broad asset seizure powers and wastes enormous resources on ineffectual “public education” efforts on the evils of corruption. In 2010 the ICPC published a front-page interview with controversial Ogun State governor Gbenga Daniel in its glossy promotional magazine which uncritically examined the governor’s claims to fight corruption by “monitoring performance” of government agencies and remaining in close contact with his constituents. Meanwhile, in 2011 the EFCC announced that it was probing allegations of corruption against the same governor. Some critics, including Attorney General Mohammed Adoke, have called for the merger of the ICPC with the EFCC to strengthen anti-corruption efforts. Human Rights Watch does not take a position on this issue, but notes that there is not necessarily any reason to believe that simply merging or restructuring these institutions would address the root causes of their disappointing records. The Code of Conduct Bureau (CCB) and the Code of Conduct Tribunal—constitutionally mandated bodies, first established in 1990—have a far more narrow and specific mandate than the EFCC and ICPC: to enforce a code of conduct for public officials. The primary role of the CCB is to collect asset declarations from every one of Nigeria’s approximately 2.1 million public officials and verify their accuracy. Analyzing so many declarations in a meaningful way would be a logistical impossibility, and the bureau doesn’t try to do so. CCB chairman Sam Saba says that the bureau focuses its attention on the asset declarations of high-level officials and officials who are the subject of public petitions alleging financial misconduct. That focus is a sensible one, but Saba acknowledges that even there his bureau makes little progress. “On the investigation side we have received a lot of petitions [alleging wrongdoing],” he complained, “but our staff do not have the capacity to properly investigate and prosecute these cases.” The CCB and the Code of Conduct Tribunal have a combined annual budget of some $8.3 million, with more than 80 CCB investigators stationed in the Abuja office and state capitals across Nigeria. On the other hand, Senator Akinyede told Human Rights Watch that, “I believe the CCB likes to use the lack of legislation as an excuse for non-performance.” He pointed out that the Code of Conduct Bureau and Tribunal Act allows the institution to discipline any public officer who cannot account for the sources of his or her wealth—a power he says the CCB has used sparingly and perhaps never at all. In May 2011 the National Assembly passed, and President Jonathan signed into law, the Freedom of Information Act that guarantees the public the right to access public records. This new law could provide an alternative—albeit indirect and potentially complicated—way to force disclosure of this information. There are other very important powers at the CCB’s disposal that it appears to make inadequate use of. The Code of Conduct Tribunal can remove public officials from office and bar them from holding office for a period of up to 10 years for violating any provision of the code of conduct for public officials set down in Nigeria’s constitution—several provisions of which deal with financial probity and transparency. It forbids, for example, high-level officials including state governors from maintaining any bank account outside of Nigeria. Yet Chairman Saba told Human Rights Watch that the tribunal never pursues such sanctions because it did not want to make public officials suffer. “[The tribunal] does not like to ask public officers to vacate office because thereby so many mouths would be rendered hungry,” he said. “So a judge … would prefer to issue a fine”—often a miniscule amount in the range of five to ten thousand naira (roughly $35-65). In the end, the CCB has had little impact in keeping corrupt politicians out of public office. In the April 2011 elections, 15 politicians who had been arraigned by the EFCC on corruption charges ran for office, seemingly unencumbered by the CCB. In fact, the CCB has only pursued one case against a nationally prominent political figure in the past two years: former EFCC chairman Nuhu Ribadu was hauled before the tribunal in 2009 for allegedly failing to declare his assets, a charge he adamantly denied. The case was eventually withdrawn by the attorney general in 2010 without any public explanation. Nigeria’s foreign partners have a mixed record on applying meaningful pressure on the Nigerian government to address endemic corruption, poor governance, and human rights abuses. The EFCC was created in 2002 in part due to international pressure to address pervasive economic and financial crimes that plagued Nigeria, and Western governments—including the United States, United Kingdom, and the European Union—have provided substantial assistance in technical support and capacity building to the EFCC. Between 2006 and 2010, the European Union—the EFCC’s largest donor—provided US$23.5 million of assistance to the agency. Foreign law enforcement agencies, such as the US Federal Bureau of Investigation and the London Metropolitan Police, have also trained key EFCC investigators. The US government has been outspoken, both publicly and—as the WikiLeaks cables have revealed—privately on the issue of government corruption in Nigeria. Senior US government officials, including Secretary of State Hilary Clinton, have publically called on the Nigerian government to address political corruption and poor governance, and improve transparency. Nigeria’s other foreign partners have been less willing to criticize Nigeria’s poor record on this front. Furthermore, following the sacking of Ribadu, and Waziri’s controversial appointment, the US ambassador cut off high-level contact with the EFCC chairman. As noted above, leaked US government cables also reveal growing impatience with Waziri’s perceived ineffectiveness on the part of other donors, including the UK, Germany and The Netherlands—though the US government was alone in cutting off high-level contact with and assistance to the EFCC. Despite strong rhetoric and assistance by some donors, critics argue that these same governments have been much less willing tackle corruption by going after corrupt Nigerian politicians and financial institutions in the West where they launder their funds, either through criminal prosecutions, asset forfeitures, or visa bans. The US government took an important step in 2010 by revoking the US visa of the notorious former attorney general Michael Aondoakaa, for his “links to corruption,” but despite the wealth of evidence they had of his corrupt activities, they only took action after he had left office. Aondoakaa also freely traveled to the UK while he was actively seeking to undermine the British anti-money laundering case against former Delta State governor James Ibori. The United Kingdom is the one country that has moved aggressively to prosecute high-level Nigerian officials for money laundering. The most successful agency has been a unit in the Metropolitan Police Service that targets international money laundering. Funded in part by the UK Department for International Development, the unit has brought money laundering charges against three former Nigerian governors—Joshua Dariye, Diepreye Alamieyeseigha, and James Ibori (see cases referred to above). Although Dariye and Alamieyeseigha skipped bail and fled to Nigeria, an English court in 2007 sentenced one of Dariye’s associates to three years in prison for laundering more than £1.4 million of public funds stolen by the Dariye—the unit’s first conviction of its kind. Later that year, a court froze Ibori’s assets, worth $35 million, and prosecutors have successfully prosecuted his wife, sister, assistant, and lawyer on money laundering charges. In May 2011 Ibori was extradited from Dubai to London where, at this writing, he was awaiting trial for money laundering. The US government has been less proactive on prosecuting corrupt foreign politicians. Despite strong rhetoric by the US officials on corruption in Nigeria, US prosecutors have brought no criminal charges against any senior-level Nigerian politicians. Former Rivers State governor Peter Odili has been apparently free to transfer his funds to the US, and by the end of 2006 was one of the largest donors to Lincoln University, the oldest historically black college in the United States. In recent years, however, the US government has taken some preliminary steps to improve international accountability for high-level corruption. In July 2010 the US Department of Justice announced a new anti-kleptocracy initiative across a range of federal agencies. And in 2011 the Justice Department sought a court order to seize $1 million in US property of former Bayelsa State governor Diepreye Alamieyeseigha, who was convicted in 2007 by the EFCC. This would be the first case of its kind to grow out of the new initiative. The following pages lay out pragmatic first steps the Jonathan administration can take to enhance the effectiveness and performance of the Economic and Financial Crimes Commission (EFCC), Independent Corrupt Practices and Other Related Offences Commission (ICPC), and Code of Conduct Bureau (CCB), and support anti-corruption efforts more broadly. If President Goodluck Jonathan is serious about fighting corruption during his first full term in office, he should signal his support for these proposals and work to push them forward without delay. Doing so would also embolden many law enforcement officials and others who until now have not been sure which side the government is really on in the fight against corruption. Publicly acknowledge that political interference with the anti-corruption work of the EFCC, ICPC, and CBB has been a serious problem in the past. Pledge that his administration will neither perpetrate nor tolerate such interference. Take steps to limit the power of the attorney general, as a member of government, to interfere in anti-corruption cases, including by amending article 174 of the constitution, which gives the attorney general power to take over or discontinue corruption or any other criminal prosecutions. In the interim, the president and attorney general should pledge that any exercise of the attorney general’s constitutional powers will be preceded by a detailed public explanation of why that action was deemed to be in the best interest of justice. Declare that he will support efforts by EFCC, ICPC and CCB officials to find ways to be more proactive and aggressive in using their statutory powers to fight corruption. While the EFCC Act requires Senate confirmation of the president’s nominee for EFCC chairman, it allows the president to dismiss the chairman or any other member of the commission at will. This has been and continues to be a severe constraint on the independence and integrity of the EFCC. The EFCC Act should be amended to grant the EFCC chairman robust security of tenure. At a minimum, the position should enjoy the same tenure security as the ICPC chairman, who the president cannot remove from office without the assent of a two-thirds majority of the Senate—and even then only on grounds of incapacity or misconduct. Human Rights Watch recommends that President Jonathan consult with legislators, civil society leaders, and officials of the ICPC and EFCC to determine whether still more strenuous protections are necessary—such as constituting a panel that includes civil society participation to approve the removal of the head of the EFCC. The EFCC Act should also be amended to explicitly bar any attempt by the inspector general of police to effectively remove an EFCC chairman who is also a serving police officer by “redeploying” or demoting them—devices the Yar’Adua administration employed to rid itself of Nuhu Ribadu without actually firing him. The amendment should also bar the head of any other agency other than the police, from which a future EFCC head might be seconded, from carrying out similar actions. The EFCC Act requires that the commission’s chairman be “a serving or retired member of any government security or law enforcement agency not below the rank of Assistant Commissioner of Police or equivalent.” Human Rights Watch believes this requirement should be eliminated and replaced with objective criteria focused solely on a prospective chairman’s integrity, experience and ability. The ICPC chairman, for example, need only be “qualified to hold office as a judge of a superior court of record in Nigeria,” but he or she need not have actually held that position. In principle, there are persuasive arguments to be made in favor of appointing a career law enforcement official as EFCC chairman. But Nigeria’s police force is mired in corruption and abuse and it is not easy to identify high-ranking officers who are untainted by any such allegations themselves. As one civil society campaigner put it, “If the police were doing their job we would not even have needed the EFCC.” The government should therefore have the flexibility to appoint qualified people of integrity to the position of EFCC chairman whether they have a law enforcement background or not. The EFCC’s reputation has been damaged by widespread allegations of corruption and incompetence leveled against Waziri. Although Human Rights Watch has seen no concrete evidence of corruption, these rumors are so pervasive that they will continue to undermine the credibility of the EFCC’s work until they are addressed. Human Rights Watch believes that President Jonathan’s administration should examine Waziri’s record of performance to determine whether she has brought the caliber of leadership the institution needs to function effectively. Nigeria’s constitution explicitly states that all public officials must declare their assets and the CCB may make these asset declarations available for inspection by any Nigerian citizen “on such terms and conditions as the National Assembly may prescribe.” This is an enormously important power that would greatly enhance the transparency of public officials’ finances. But since 1999, the CCB has taken the position that because the National Assembly has never passed legislation laying down those “terms and conditions,” it has no power to make asset declarations publicly available at all. The surest way to remedy this problem would be for the National Assembly to pass legislation guaranteeing broad public access to the CCB’s trove of asset declarations and empowering the bureau to set up systems to manage that information and make it easily accessible. In May 2011 the National Assembly passed the Freedom of Information bill, which President Jonathan signed into law. The new law guarantees the public the right to access public records. It may provide an alternative way to force disclosure of this information. In a similar manner, President Jonathan should push the National Assembly to pass legislation without delay that specifically guarantees public access to the asset declarations of public officials. As discussed above, critics of the ICPC have long complained that the institution has been hobbled by leadership that is too conservative and unwilling to deploy its full range of powers to fight high-level corruption. Regardless of whether those critiques are fair, the time to get the right leadership in place for the ICPC is now. Former chairman Emmanuel Ayoola stepped down in 2010 and at the time of writing President Jonathan had yet to replace him. The Senate rejected the president’s nomination of retired Supreme Court justice Pius Olayiwola Aderemi in February 2011 because the applicant was seen as not dynamic enough to take the institution forward. President Jonathan then nominated Francis Elechi as a second candidate for the post in May 2011, but opposition parties have opposed his nomination, claiming that Elechi is a member of the ruling People’s Democratic Party (PDP) with close ties to Rivers State Governor Rotimi Amaechi. President Jonathan should consult widely with civil society and members of the National Assembly and ensure that any nominee for ICPC chairman has sufficient independence with a proven record of integrity, competence, and efficiency, and who can articulate a clear vision of how he or she would put the ICPC where it belongs—at the front lines of Nigeria’s fight against corruption. President Jonathan’s administration should study ways to bolster the human and material capacity of the judiciary, including the appellate courts. A good place to start would be improving the basic infrastructure of the court system. The government should consider reforms to federal criminal procedure and evidence rules, which have remained largely unmodified since the colonial period. The government should explore the idea of designating special corruption courts within the existing federal court system—these would receive additional resources, enjoy lighter caseloads and provide both financial incentives and additional security to judges working on high-profile corruption cases. They would be staffed with judges possessing the background needed to understand complex financial crimes. This is not a new idea—it would largely mean expanding existing programs that designate certain judges as focal points for EFCC cases. The case against Olabode (“Bode”) George was cited earlier in this report as an example of the ways Nigeria’s political establishment reinforces impunity by embracing corrupt officials. But the trial itself was also a model of judicial efficiency and integrity, taking less than two years from arraignment to sentencing and ending with the EFCC’s first and—so far only—conviction at trial of a former high-level public official. George’s trial took place in Lagos State High Court, not before the federal bench. Experts interviewed by Human Rights Watch attributed the unusually functional process to reforms of the Lagos State court system and to the dedication and integrity of presiding judge Olubunmi Oyewole, who at the time was designated by the state court system as one of several judges handling EFCC cases—the only state court system to do so. Lagos State is also the only state court system to have modernized its rules of criminal procedure and evidence. The courts provide judges with basic infrastructural upgrades such as recording devices (obviating the need for judges to record all of their proceedings by hand) and relatively comfortable work environments, making it possible for judges to work longer and more efficiently. And in the George trial, Justice Oyewole refused to halt the trial for any interlocutory appeals, ruling that appeals would have to wait until after the trial was completed. All of these factors combined to yield a fair and relatively speedy trial that could serve as a useful model for other Nigerian courts. Take first steps towards a broader effort to bolster the capacity and integrity of the federal courts. Investigate the reasons behind the EFCC’s failure to challenge the judgment and subsequent perpetual injunction obtained by Peter Odili against the agency at the time they were handed down. Take steps to modernize and support state judiciaries including by improving the institutional and infrastructural support offered to the judiciary. Amend the Code of Conduct Bureau and Tribunal Act to define specific terms and conditions for public access to the asset declarations of public officials, as provided by the Nigerian Constitution. Pass the Evidence Act (Amendment) Bill to modernize the rule of evidence, including admission of electronic evidence. Consider passage of the Special Courts (Establishment) Bill to designate specific courts to hear corruption cases. Set an example of institutional transparency by requiring all senior EFCC officials to publicly declare the total value of all person assets. Investigate, arrest, and prosecute according to international fair trial standards, or publicly explain the reasons for not prosecuting, politicians and government officials credibly implicated in embezzlement of state funds. If the evidence against former Rivers State governor Peter Odili is as strong as EFCC officials claim, charge Odili to court without delay. Use his trial as a vehicle to challenge the injunction that purports to restrain EFCC action against the former governor. Make much more proactive use of the ICPC’s power to compel public officials to explain the origins of suspiciously extensive property holdings and other assets. Moving forward, prioritize increasing the number of high-level prosecutions under the ICPC Act. Make public the asset declarations of public officials; in the short term, respond favorably to petitions made under the Freedom of Information Act seeking the release of individual asset declarations. Make widespread and proactive use of the Code of Conduct Tribunal’s power to remove public officials from office for failing to file or filing false asset declarations. Explore more proactive modes of cooperation with the Central Bank of Nigeria in verifying the asset declarations of prominent public officials. Maintain strong political pressure on the Nigerian government to allow anti-corruption institutions, including the EFCC, to pursue robust and independent investigations of high-level corruption. Urge the Nigerian government to implement the recommendations described in this report, and offer technical assistance in doing so where appropriate. Actively pursue opportunities to bring criminal charges against Nigerian politicians and government officials who commit financial crimes in foreign jurisdictions. Make wide and proactive use of visa bans to deny Nigerian politicians and government officials credibly implicated in corruption the opportunity to travel or invest their wealth abroad. Make public the names of all Nigerian government officials denied visas because of allegations of corruption. This report was researched and authored by Chris Albin-Lackey, senior researcher in the Business and Human Rights Division and Eric Guttschuss, Nigeria researcher in the Africa Division of Human Rights Watch. It was reviewed and edited by Arvind Ganesan, business and human rights director; Corinne Dufka, senior West Africa researcher; Clive Baldwin, senior legal advisor; and Babatunde Olugboji, deputy program director. Additional research, editorial and production assistance was provided by Darcy Milburn, business and human rights associate, and Marianna Enamoneta, Africa division associate. The report was prepared for publication by Kathy Mills, publications coordinator; Anna Lopriore, creative manager; and Fitzroy Hepkins, mail manager. Human Rights Watch expresses its gratitude to the individuals and organizations who offered their assistance in facilitating this research and who have generously supported its work on Nigeria. See Human Rights Watch, Chop Fine: The Human Rights Impact of Local Government Corruption and Mismanagement in Rivers State, Nigeria, vol. 19, no. 2(A), January 2007, http://www.hrw.org/node/11043; Human Rights Watch, Criminal Politics: Violence, “Godfathers” and Corruption in Nigeria, vol. 19, no. 16(A), October 2007, http://www.hrw.org/node/10661; Human Rights Watch, Politics as War: The Human Rights Impact and Causes of Post-Election Violence in Rivers State, Nigeria, vol. 20, no. 3(A), March 2008, http://www.hrw.org/en/reports/2008/03/26/politics-war-0; Human Rights Watch, “Everyone’s in on the Game”: Corruption and Human Rights Abuses by the Nigeria Police Force, 1-56432-671-3, August 2010, http://www.hrw.org/en/reports/2010/08/17/everyone-s-game-0. Several prominent Nigerian commentators have embraced this description. See, for example, Reuben Abati, “Nigeria: A Crippled Giant at 50,” The Guardian (Lagos), October 1, 2010; Eghosa E. Osaghae, Crippled Giant: Nigeria Since Independence (Bloomington, Indiana: Indiana University Press, 1998). Government revenue totaled $45.4 billion in 2008, but an estimated 64 percent of Nigerians live on less than $1.25 a day, and the country’s maternal mortality and infant mortality rates are among the worst in the world. See “FG, States, LGs Share N5.446 Trillion from Federation Account in 2008,” Federal Ministry of Finance Press Release, February 1, 2009; United Nations Development Programme, “Human Development Report 2010,” November 2010, http://hdr.undp.org/en/reports/global/hdr2010/chapters/en/ (accessed March 22, 2011); World Health Organization, “Maternal Mortality in 2005,” http://www.who.int/making_pregnancy_safer/documents/9789241596213 (accessed April 27, 2011). See “Nigeria leaders ‘stole’ $380bn,” BBC News Online, October 20, 2006, http://news.bbc.co.uk/2/hi/africa/6069230.stm (accessed March 23, 2011). Although precise figures are impossible to determine, some diplomats in 2007, for example, estimated that Nigeria lost a minimum average of $4 billion to $8 billion per year to corruption from 1999 to 2007. Human Rights Watch interviews with diplomats (names withheld), Abuja, April 2007; and telephone interview with diplomat (name withheld), June 18, 2007. See Human Rights Watch, Chop Fine: The Human Rights Impact of Local Government Corruption and Mismanagement in Rivers State, Nigeria . See Human Rights Watch, Election or “Selection?”— Human Rights Abuse and Threats to Free and Fair Elections in Nigeria, no.1, April 2007, http://www.hrw.org/legacy/backgrounder/africa/nigeria0407/; Human Rights Watch, Criminal Politics: Violence, “Godfathers” and Corruption in Nigeria; Human Rights Watch, Politics as War: The Human Rights Impact and Causes of Post-Election Violence in Rivers State, Nigeria. See Human Rights Watch, “Everyone’s in on the Game”: Corruption and Human Rights Abuses by the Nigeria Police Force. For more on the ICPC, see the ICPC section below. The CCB is responsible for enforcing the Code of Conduct for Public Officers. This includes collecting and verifying the asset declaration forms of public officials and referring cases to the Code of Conduct Tribunal for disciplinary action. For more on the CCB, see the CCB section below. See text of President Obasanjo’s speech, “From Pond of Corruption to Island of Integrity,” November 7, 2003, available at http://allafrica.com/stories/200311200461.html (accessed June 29, 2011). Human Rights Watch email correspondence with Femi Babafemi, head of media and publicity at the EFCC, Abuja, August 5, 2011. See also Appropriation Amendment Bill 2010, Budget Office of the Federation, Federal Republic of Nigeria, http://www.budgetoffice.gov.ng/2010%20app%20amended/2010%20AMENDMENT%20(NASS)BOF_v1.pdf (accessed August 10, 2011) (Appropriation Amendment Bill 2010). See Criminal Code Act, ch. 33, sec. 419, http://www.nigeria-law.org/Criminal%20Code%20Act-Tables.htm (accessed June 29, 2011). Human Rights Watch interview with Babajide Ogundipe, former EFCC outside counsel, Lagos, February 19, 2011. The bank in question was Brazil’s Banco Noroeste; the fraud was discovered in the course of an audit that preceded the bank’s sale to Banco Santander, a Spanish bank. See “Nigerian bank fraudsters guilty,” BBC News Online, November 19, 2009, http://news.bbc.co.uk/2/hi/africa/4451766.stm (accessed June 17, 2011). Section 6 of the Economic and Financial Crimes Commission (Establishment) Act, 2004 (“EFCC Act”) lists various functions of the commission but makes no specific reference to corruption, embezzlement, or bribery. The commission’s power to investigate and prosecute those offenses is derived from the EFCC Act’s broad grant of power to enforce other laws “relating to economic and financial crimes” in section 7, coupled with an expansive definition of “economic and financial crimes” in section 46 that includes, inter alia, “embezzlement, bribery, looting and any form of corrupt malpractices.” See EFCC Act, secs. 6, 7, and 46, http://www.efccnigeria.org/index.php?option=com_docman&task=doc_view&gid=5 (accessed April 27, 2011). Human Rights Watch interview with Sola Akinyede, chairman of the Senate Committee on Narcotics, Financial Crime and Anti-Corruption, Abuja, February 23, 2011. See “Ribadu in Senate - 31 Governors Under Investigation,” THISDAY (Lagos), September 28, 2006. For more on Ribadu’s rise and fall, see Azubuike Ishiekwene, The Trial of Nuhu Ribadu: A Riveting Story of Nigeria’s Anti-Corruption War (Ibadan: Spectrum Books, 2008). Human Rights Watch interviews with lawyers and civil society activists, Abuja and Lagos, February 2011. Human Rights Watch interview with former EFCC source (name and location withheld), February 2011. See “Nigerian ex-police chief jailed,” BBC News Online, November 22, 2005, http://news.bbc.co.uk/2/hi/africa/4460740.stm (accessed August 9, 2011). For more on the Tafa Balogun case, see section belowon convictions. See Human Rights Watch, Election or “Selection?”— Human Rights Abuse and Threats to Free and Fair Elections in Nigeria, pp. 31-36; US State Department,“NIGERIA: EFCC CHAIR WAZIRI’S FIRST MONTH, SOME WORRYING SIGNS,” cited in WikiLeaks cable ID: 164047, July 29, 2008, http://234next.com/csp/cms/sites/Next/Home/5682972-146/story.csp (accessed July 14, 2011). See Human Rights Watch, Election or “Selection?”— Human Rights Abuse and Threats to Free and Fair Elections in Nigeria. Human Rights Watch interviews with EFCC sources, Abuja, February 2011. Human Rights Watch interview with Rabe Nasir, chairman of the House of Representatives Committee on Drugs, Narcotics & Financial Crimes, Abuja, February 24, 2011. See text box below, The Attorney General’s War on the EFCC. See “Nigeria: Firing of Anti-Corruption Chief Would Boost Abusive Politicians,” Human Rights Watch news release, January 1, 2008, http://www.hrw.org/en/news/2008/01/02/nigeria-firing-anti-corruption-chief-would-boost-abusive-politicians. Human Rights Watch interview with EFCC source (name and location withheld), February 2011. See “Nuhu Ribadu, Fighting Corruption in Nigeria,” National Public Radio, Morning Edition, April 4, 2007. See Camillus Eboh, “Nigerian police demote former anti-graft head,” Reuters, August 6, 2008. See Taye Obateru, “Drama at NIPSS - Ribadu Denied Graduation, Arrested,” Vanguard (Lagos), November 24, 2008. See Eboh, “Nigerian police fire former anti-graft chief,” Reuters, December 23, 2008. See “ Nigeria: Protect Anti-Corruption Czar, ” Human Rights Watch news release, December 3, 2008, http://www.hrw.org/en/news/2008/12/03/nigeria-protect-anti-corruption-czar; “Ribadu tells of Nigeria corruption battle,” BBC News Online , November 10, 2009, http://news.bbc.co.uk/2/hi/africa/8322992.stm (accessed May 5, 2010). See Tobi Soniyi, “Code of Conduct Tribunal orders Ribadu’s arrest,” Punch (Lagos), November 21, 2009. Jonathan had removed Aondoakaa from his post as attorney general in February 2011, the day after the National Assembly passed a resolution declaring Jonathan acting president during Yar’Adua’s absence on health grounds. See Okey Muogbo et al., “Jonathan redeploys Aondoakaa,” Nigerian Tribune (Ibadan), February 10, 2010. See Yusuf Alli, “Police Commission reinstates Ribadu,” TheNation (Lagos), May 25, 2010. See Jon Gambrell, “ Case against anti-corruption czar dropped,” Associated Press, May 5, 2010. The attorney general, Mohammed Adoke, later acknowledged that “ [t] here was no substantial evidence to link him to the crime he was said to have committed,” and that the “general perception” was that Ribadu had been prosecuted “because he stepped on toes as the chairman of EFCC.” See Emmanuel Ogala, “Government had no case against Ribadu,” Next (Lagos), June 20, 2011. Ribadu won less than 2.1 million votes, in comparison to roughly 22.5 million for Jonathan and 12.2 million for Buhari. See “Summary of the 2011 Presidential Election Results,” Independent National Electoral Commission, http://www.inecnigeria.org/results/presidential/ (accessed June 21, 2011). See section below, Allegations of Poor Leadership. See Farida Waziri, “The Economic and Financial Crimes Commission’s (EFCC’s) Critical Role in Growing the Economy” paper presented to the Nigeria-British Chamber of Commerce, May 7, 2011, http://www.efccnigeria.org/index.php?option=com_content&task=view&id=1165&Itemid=34 (accessed June 21, 2011). Human Rights Watch interview with EFCC source (name and location withheld), February 2011. Human Rights Watch interviews with western diplomatic officials, Abuja, February 17, 2011. Human Rights Watch interview with Tunde Lemo, deputy governor (operations) of the Central Bank of Nigeria, Abuja, February 23, 2011. In 2009, the Central Bank under Governor Lamido Sanusi had determined that five major banks, including Oceanic Bank, were close to insolvency, a scandal that threatened economic mayhem and shattered confidence in the entire banking sector. See “Nigeria sacks heads of five banks,” BBC News Online, August 14, 2009, http://news.bbc.co.uk/2/hi/business/8202588.stm (accessed June 29, 2011). See “Nigeria banker jailed, ordered to hand over $1.2 bln,” Reuters, October 8, 2010. Human Rights Watch interview with Tayo Oyetibo, Lagos, February 18, 2011. Human Rights Watch interview with Festus Keyamo, Lagos, February 21, 2011. Human Rights Watch interview with Farida Waziri, Abuja, February 24, 2011. See Human Rights Watch, Chop Fine: The Human Rights Impact of Local Government Corruption and Mismanagement in Rivers State, Nigeria ; Human Rights Watch, Election or “Selection?”— Human Rights Abuse and Threats to Free and Fair Elections in Nigeria ; Human Rights Watch, Criminal Politics: Violence, “Godfathers” and Corruption in Nigeria ; Human Rights Watch, Politics as War: The Human Rights Impact and Causes of Post-Election Violence in Rivers State, Nigeria; Human Rights Watch, “Everyone’s in on the Game”: Corruption and Human Rights Abuses by the Nigeria Police Force . These pages focus on a more narrow category of people than the traditional concept of “politically exposed person” (PEP)—a broader category of individuals in positions of public trust often used for banking, anti money-laundering, and other regulations. PEPs, for example, include local government chairmen and state government officials; this report does not examine those cases. Given that the EFCC does not appear to have a complete list of PEPs it has investigated since 2003, such a comparison might in any case be impossible to make. See, for example, “Ribadu in Senate - 31 Governors Under Investigation,” THISDAY (Lagos), September 28, 2006. As of May 2010, the EFCC claimed that it had 52 “high - profile” ongoing cases and that 41 of these had been filed under Waziri. “High profile” is a flexible concept, however, and the EFCC seems to be quite generous in applying it to the cases brought under Waziri. The EFCC’s published list of those cases includes prosecutions of relatively obscure figures such as the director general of Abuja’s National Gallery of Art, as well as two separate cases against unnamed Filipino and Ghanaian nationals accused of oil bunkering (theft of crude oil). See E FCC , “EFCC On-Going High Profile Cases— 2007-2010,” http://www.efccnigeria.org/index.php?option=com_docman&task=doc_view&gid=15&Itemid=82 (accessed May 2, 2011). See Lanre Adewole and Dare Adekanmbi, “Corruption probe: EFCC investigating 9 ex-govs,” Nigerian Tribune (Ibadan), June 30, 2011. See Appropriation Amendment Bill 2010; Human Rights Watch interview with foreign donor agency official (name withheld), Abuja, February 24, 2011. See Camillus Eboh, “Nigeria charges ex-police chief with corruption,” Reuters, April 4, 2005. Balogun was convicted in December 2005 in a plea bargain agreement. See section below on convictions. See Tume Ahemba, “Nigeria accuses ex-governor of stealing $55 mln,” Reuters, December 20, 2005. Alamieyeseigha was convicted in July 2007 in a plea bargain agreement. See section below on convictions. See Tobi Soniyi, “Audu charged with stealing over N5bn,” Punch (Lagos), December 2, 2006. See section below, A System that Rewards Corruption. See Iseoluwa Ige, “Ex-Govs Dariye, Turaki, Kalu Diverted Over N40bn Public Funds – EFCC,” Vanguard(Lagos), July 17, 2007. The EFCC filed money laundering charges against Dariye in December 2004, but the Federal High Court threw out the case on grounds that the governor was protected by immunity from prosecution while in office. See text box below, Justice Delayed—The Joshua Dariye Trial. See Ise-Oluwa Ige et al., “Dariye, Nyame Join Kalu, Turaki in Prison,” Vanguard (Lagos), July 20, 2007. See Mohammed Shosanya, “Nnamani, Others Arraigned Over Fraud Charges,” Daily Trust (Abuja), July 27, 2007. See Camillus Eboh, “Nigeria ex-governor bribed police –prosecutor,” Reuters, December 13, 2007. Federal High Court judge Marcel Awokulehin dismissed the charges against Ibori in December 2009. See section below, The Case of Former Delta State Governor James Ibori. See Innocent Anaba and Andrew Idemudian, “Fayose Faces 51-Count Charge,” Vanguard (Lagos), December 17, 2007. See “Nigerian ex-governor indicted on graft charges: official,” Agence France-Presse, January 23, 2008. Igbinedion was convicted in December 2008 in a plea bargain agreement. See section below on convictions. Senator Bell-Obasanjo is also the daughter of former president Olusegun Obasanjo. See Camillus Eboh, “Nigeria ex-president’s daughter charged with graft,” Reuters, April 8, 2008. Ibid. The Court of Appeal, in March 2009, dismissed the charges against Aduku. See Ise-Oluwa Ige & Ikechukwu Nnochiri, “N300 Million Health Scam – Court Frees Aduku,” Vanguard (Lagos), March 24, 2009. See Camillus Eboh, “Nigeria ex-ministers charged over air safety fund,” Reuters, July 2, 2008. See Mohammed Lawal Shuaibu and Boco Edet “Botmang Embezzled N1.9bn in 6 Months – Efcc,” Daily Trust (Abuja), July 21, 2008. See George Agba, “Boni Defrauded Adamawa of N93.9 Million – EFCC,” Leadership (Abuja), August 6, 2008. See Davidson Iriekpen et al., “EFCC Arraigns Ladoja, Seven Others,” THISDAY (Lagos), September 1, 2008. Olabode George was also the national vice-chairman, in the southwest zone, of the ruling People’s Democratic Party (PDP). See Akinwale Akintunde, “EFCC Arraigns Bode George, Four Others,” THISDAY (Lagos), August 11, 2008. George was convicted in January 2009. See section below on convictions. See Ibrahim Khalil Aminu, “N6 Billion Fraud – Ugbane, Elumelu, Aliyu Charged,” Daily Trust (Abuja), May 19, 2009. See Rakiya A. Muhammad and Atika Balal, “Alleged N15 Billion Fraud – Court Remands Bafarawa in Prison,” Daily Trust (Abuja), December 17, 2009. See “Nigerian ex-governor on 100 million dollar graft charges,” Agence France-Presse, March 3, 2010. See Ise-Oluwa Ige, “Nigeria: El-Rufai Docked, Drags FG to Court Over Trial,” Vanguard (Lagos), May 13, 2010. See Ikechukwu Nnochiri, “Lawal, Ex-Works Minister Remanded in Prison,” Vanguard (Lagos), May 12, 2011. See Joel Olatunde Agoi, “Nigerian top politician says not guilty of graft,” Agence France-Presse, June 8, 2011. See “Nigeria ex-speaker, deputy accused of diverting loans worth more than $244M, plead not guilty,” Associated Press, June 13, 2011. See section below, Judicial Inefficiency and Deliberate Delay. See “Nigerian ex-police chief jailed,” BBC News Online, November 22, 2005; Federal Republic of Nigeria vs. Tafa Adebayo Balogun, Federal High Court of Nigeria, Suit no. FHC/ABJ/CR/14/2005, Judgment, November 22, 2005 (on file with Human Rights Watch). See Davidson Iriekpen and Funso Muraina, “Nigeria: Former Governors in ‘Plea Bargain’ With EFCC,” THISDAY (Lagos), July 27, 2007. See Emmanuel Bello, Habib I. Pindiga, and Ruby Rabiu, “Nigeria: Mixed Reactions Over Alamieyeseigha’s Return, Balogun’s Sentence,” Daily Trust (Abuja), November 24, 2005. Human Rights Watch interview with civil society leader (name withheld),Lagos, February 18, 2011. See “ Nigeria governor to be impeached” BBC News Online, November 25, 2005, http://news.bbc.co.uk/2/hi/africa/4462444.stm (accessed June 21, 2011). See Lydia Polgreen, “As Nigeria Tried to Fight Graft, a New Sordid Tale,” The New York Times, November 29, 2005, http://www.nytimes.com/2005/11/29/international/africa/29nigeria.html?pagewanted=print (accessed May 2, 2011). See Tume Ahemba, “Nigeria accuses ex-governor of stealing $55 mln,” Reuters, December 20, 2005. See Dulue Mbachu, “Former Nigerian state governor freed a day after corruption conviction,” Associated Press, July 28, 2007. See Olayinka Oyebode, “Alamieyeseigha: From ex-convict to PDP superstar,” Punch (Lagos), May 17, 2008. See “Nigerian ex-governor indicted on graft charges: official,” Agence France-Presse, January 23, 2008. See section below, Concerns About Judicial Impropriety and Corruption. See “EFCC Seals off Igbinedion’s Abuja Properties,” EFCC news release, March 8, 2011, http://www.efccnigeria.org/index.php?option=com_content&task=view&id=1112&Itemid=69 (accessed August 10, 2011). See Jethro Ibileke, “Federal court discharges Lucky Igbinedion of corruption charges,” Next (Lagos), June 1, 2011. See Akinwale Akintunde, “EFCC Arraigns Bode George, Four Others,” THISDAY (Lagos), August 11, 2008. See “Nigeria jails top political aide,” BBC News Online, October 27, 2009, http://news.bbc.co.uk/go/pr/fr/-/2/hi/africa/8327510.stm 2009/10/27 (accessed June 21, 2011). See section below, A System that Rewards Corruption. Human Rights Watch interview with senior law enforcement official (name and location withheld), February 2011. Human Rights Watch has documented the corruption and criminality that characterize Nigeria’s political system in past reports. See Human Rights Watch, Election or “Selection?”— Human Rights Abuse and Threats to Free and Fair Elections in Nigeria;Human Rights Watch, Criminal Politics: Violence, “Godfathers” and Corruption in Nigeria; Human Rights Watch, Politics as War: The Human Rights Impact and Causes of Post-Election Violence in Rivers State, Nigeria. See text box below, The Bode George Trial. See Gbenga Adeniji, “Bode George: Mega reception for an ex-convict,” Punch (Lagos), March 1, 2011; Emmanuel Aziken et al., “Anger, shock greet lavish reception for Bode George,” Vanguard (Lagos), February 28, 2011. See Godwin Oritseet et al., “I’ve now learnt my lesson – Bode George” Vanguard (Lagos), February 27, 2011. See Henry Ojelu, “Bode George’s Trial Judge In Trouble,” P.M.NEWS (Lagos), April 13, 2010. See Jude Owuamanam, “Jang, Dariye win in Plateau,” Punch (Lagos), April 29, 2011; Ahmed Tahir Ajobe and Hir Joseph Lafia, “Nasarawa: Senator-elect, Adamu, chased from polling units,” Sunday Trust (Abuja), April 17, 2011; For more on Dariye’s case, see text box below, Justice Delayed—The Joshua Dariye Trial. See Dipo Kehinde, “Anti-graft campaign and the 2011 elections,” Nigerian Compass (Lagos), May 7, 2011. Abubakar Audu and Rashid Ladoja won their party nominations to the Kogi and Oyo gubernatorial elections even though they were facing charges of money laundering themselves. Election to the governor’s office would grant them impunity from prosecution. Ladoja lost the election in Oyo State, and the election in Kogi State was postponed until December 2011 (s ee section below, Judicial Inefficiency and Judicial Delay). Former Enugu State governor Chimaroke Nnamani ran for Senate with the ruling People’s Democratic Party (PDP). Former Jigawa State governor Saminu Turaki, former Taraba State governor Jolly Nyame, and former Adamawa State governor Boni Haruna ran for Senate with the opposition Action Congress of Nigeria (ACN). Former Abia State governor Orji Kalu ran for Senate with the opposition Progressive Peoples Alliance (PPA). Former Ekiti State governor Ayo Fayose ran for Senate with the opposition Labour Party. See Emman Ovuakporie, “Waziri’s EFCC and the 2011 elections,” Vanguard (Lagos), May 7, 2011. See EFCC Act, sec. 3(2). Section 3(2) provides: “A member of the Commission may at any time be removed by the President … if the President is satisfied that it is not in the interest of the Commission or the interest of the public that the member should continue in office.” For more detail on this issue, see An Agenda for the Jonathan Administration, below. See section above, The Rise and Fall of Nuhu Ribadu. Statement by Nuhu Ribadu in the UK money laundering case against former Delta State governor James Ibori, August 26, 2009, p. 6 (copy of statement on file with Human Rights Watch). Human Rights Watch interview with Rotimi Jacobs, outside counsel at the EFCC, Lagos, February 21, 2011. A new branch of the federal court was then set up in Asaba, Delta State, to hear the case,and the judge dismissed all charges against Ibori without letting the case go to trial. For more on the Ibori case, see text box below, $15 Million Bribe to Stop an Investigation. US State Department, “NIGERIA: EFCC CHAIR WAZIRI REVEALS SERIOUS LIMITATIONS,” cited in WikiLeaks cable ID: 178565, November 17, 2008, http://234next.com/csp/cms/sites/Next/Home/5682972-146/story.csp (accessed June 29, 2011). See Estelle Shirbon, “Britain freezes assets of Nigerian ex-governor,” Reuters, August 6, 2007. For a copy of the attorney general’s August 7, 2007 letter to Ibori’s lawyer, see “EXCLUSIVE: Attorney General, Michael Aondoakaa’s letter to Ibori’s lawyer” SaharaReporters, October 3, 2007, http://www.saharareporters.com/report/exclusive-attorney-general-michael-aondoakaas-letter-iboris-lawyer (accessed June 21, 2011). See Emma Anya and Musikilu Mojeed, “Attorney-General’s letter set Ibori free,” Punch (Lagos), October 4, 2007. See Heidi Blake, “WikiLeaks cables: Nigeria pressured UK to drop charges against politician,” The Telegraph (UK), February 4, 2011. US State Department, “NIGERIA: THE ENCYCLOPEDIA OF NEW MINISTERS,” cited in WikiLeaks cable ID: 184822, December 24, 2008, http://234next.com/csp/cms/sites/Next/News/National/5685067-146/wikileaks_cable_aondoakaa_is_a_thug.csp (accessed June 29, 2011). US State Department, “NIGERIA: EFCC CHAIR WAZIRI REVEALS SERIOUS LIMITATIONS,”cited in WikiLeaks cable ID: 178565, November 17, 2008. See Emeka Madunagu and Comfort Oseghale, “We’ve revoked Aondoakaa’s visa – US,” Punch (Lagos), July 2, 2010; “US Imposes Travel Ban On Former AGF Michael Aondoakaa; Family Also Affected,” SaharaReporters (New York), June 24, 2010, http://saharareporters.com/news-page/us-imposes-travel-ban-former-agf-michael-aondoakaa-family-also-affected?page=1 (accessed August 10, 2011). For a copy of the January 28, 2011 letter from the attorney general to the ICPC, see “Original Copy Of AGF Bello Adoke ’ s Letter To ICPC,” SaharaReporters (New York), February 1, 2011, http://www.saharareporters.com/news-page/original-copy-agf-bello-adokes-letter-icpc (accessed August 10, 2011). The case involved allegations of corruption dating back to Bello’s time as the resident electoral commissioner in Adamawa State, the post he held immediately prior to being named the federal government’s minister of state for health. Human Rights Watch interview with ICPC official (name withheld), Abuja, February 2011. See Constitution of the Federal Republic of Nigeria, sec. 174(1)(b) and (c). Section 174(3) of the Constitution provides that the attorney general “shall have regard to the public interest, the interest of justice and the need to prevent abuse of legal process” when exercising this power. See Oluokun Ayorinde, “N11.2m Fraud: AGF Ask ICPC To Hand-off Trial of Minister,” PM News (Lagos), January 31, 2011. See EFCC Act, sec. 19 (1). See EFCC Act, sec. 19 (3). 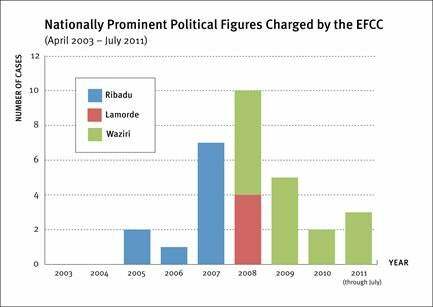 See charts above on EFCC prosecutions. Human Rights Watch telephone interview with Rotimi Jacobs, Lagos, July 5, 2011. See, e.g., Lagos State Ministry of Justice, “2011–2013 Medium Term Sector Strategy (MTSS): Final Report,” December 2009. Human Rights Watch interview with judicial official (name and location withheld), February 2011. Human Rights Watch interview with Babajide Ogundipe, Lagos, February 19, 2011. Prince Abubakar Audu v. Economic and Financial Crimes Commission and Executive Chairman, Economic and Financial Crimes Commission , Federal High Court of Nigeria, Suit No. FHC/KD/CS/110/2006, Judgment, October 10, 2006, p. 6. Audu filed a similar suit with the Federal High Court in Abuja which was also dismissed in 2007. See Prince Abubakar Audu vs. Economic and Financial Crimes Commission, Federal High Court of Nigeria, suit no. FHC/ABJ/CS/375/06, Judgment, February 5, 2007 (on file with Human Rights Watch). See Johnson Babajide, “Audu’s sickness stalls trial over misappropriation of N5bn,” Nigerian Tribune (Ibadan), April 1, 2011. Human Rights Watch interview with Ricky Tarfa, Lagos, February 22, 2011. Following inter-communal violence in Plateau State that left hundreds dead in May 2004, President Obasanjo declared a state of emergency in the state, suspending Dariye and the legislature, and appointing a six-month interim administration. After Dariye returned to Nigeria and resumed office, the EFCC filed money laundering charges against him in December 2004. The Federal High Court, however, threw out the case on ground that the governor was protected by immunity from prosecution while in office. See Mohammed Bashir, “Nigerian governor returns to office despite investigation into alleged money laundering,” Associated Press, November 18, 2004; Agaju Madugba, “Dariye ’ s Immunity Inviolable, Says Court,” THISDAY (Lagos), December 17, 2004. See Estelle Shirbon, “Court convicts Nigerian over stolen public funds,” Reuters, April 5, 2007. See Iseoluwa Ige, “Ex-Govs Dariye, Turaki, Kalu Diverted Over N40bn Public Funds – EFCC,” Vanguard (Lagos. See Federal Republic of Nigeria vs. Joshua Chibi Dariye, Federal High Court of Nigeria, Case No. FCT/HC/CR/81/2007, Record of Proceedings, July 19 2007; Federal Republic of Nigeria vs. Joshua Chibi Dariye, Federal High Court of Nigeria, Suit No. FCT/HC/CR/85/2007, ruling, July 23, 2007 (on file with Human Rights Watch). See Federal Republic of Nigeria vs. Joshua Chibi Dariye, Federal High Court of Nigeria, Case No. FCT/HC/CR/81/2007, Motion no. FCT/HC/M/138/2007, November 12, 2007 (on file with Human Rights Watch). See Federal Republic of Nigeria vs. Joshua Chibi Dariye, Federal High Court of Nigeria, Case No. FCT/HC/CR/81/2007, Motion no. FCT/HC/M/14/2008, ruling, June 3, 2008; Federal Republic of Nigeria vs. Joshua Chibi Dariye, Federal High Court of Nigeria, Case No. FCT/HC/CR/81/2007, Motion no. FCT/HC/M/329/08, ruling, November 18, 2008 (on file with Human Rights Watch). SeeChief Joshua Chibi Dariye vs. The Federal Republic of Nigeria, Court of Appeal, Abuja Judicial Division, Appeal No. CA/A/205C/2008, Judgment, June 17, 2010 (on file with Human Rights Watch). Human Rights Watch interview with Rotimi Jacobs, Lagos, February 21, 2011. Human Rights Watch interviews with EFCC officials in Abuja and Lagos, February 2011. See also Constitution of the Federal Republic of Nigeria, sec. 6. EFCC Act, sec. 19(2)(b) and (c); Human Rights Watch interviews with EFCC sources and judicial official, Lagos and Abuja, February 2011. The trial judge in the Olabode George case reportedly made use of these provisions of the EFCC Act as a basis for forcing the trial to move speedily through his court. See text box below , The Bode George Trial . Human Rights Watch interview with Festus Keyamo, Lagos, February 22, 2011. Human Rights Watch interview with Olisa Agbakoba, Lagos, February 21, 2011. See Tobi Soniyi, “Salami, Katsina-Alu Face-off Deepens,” THISDAY (Lagos), February 12, 2011. See Ikechukwu Nnochiri, “Why I Elevated Justice Odili to Supreme Court Bench - Katsina-Alu,” Vanguard (Lagos), June 24, 2011, http://allafrica.com/stories/201106241328.html (accessed July 19, 2011); Human Rights Watch, Chop Fine: The Human Rights Impact of Local Government Corruption and Mismanagement inRivers State, Nigeria. US State Department, “NIGERIA: AMBASSADOR AND HOUSE SPEAKER DISCUSS ELECTORAL REFORM, EFCC, YAR,ADUA, EKITI POLITICS,” cited in WikiLeaks cable ID: 205795, May 6, 2009, http://234next.com/csp/cms/sites/Next/Home/5681717-146/wikileaks_cable_supreme_court_bribe_.csp (accessed June 30, 2011). Human Rights Watch interviews with civil society figures, Abuja and Lagos, February 2011. See Austin Ekeinde, “Ex-governor of Nigerian oil state escapes arrest,” Reuters, March 5, 2008. See section below, Error and Incompetence. Ibid. In February 2011 the EFCC filed new criminal charges against Igbinedion, sealing off two palatial estates in Abuja that belong to the former governor. But in May 2011, the Federal High Court dismissed the case, ruling that the new charges would amount to double jeopardy. See Jethro Ibileke, “Federal court discharges Lucky Igbinedion of corruption charges,” Next (Lagos), June 1, 2011. See Federal Republic of Nigeria vs. James Onanefe Ibori, Federal High Court of Nigeria, Charge no. FHC/ASB/1C/09, Ruling Delivered in Open Court, December 17, 2009 (on file with Human Rights Watch). While the decision to prosecute Ibori cost Ribadu his career at the EFCC, the case has gone forward without him. Federal Republic of Nigeria vs. James Onanefe Ibori, Federal High Court of Nigeria, Charge no. FHC/ASB/1C/09, Ruling Delivered in Open Court, December 17, 2009 (on file with Human Rights Watch), p. 28. Human Rights Watch interview with Central Bank officials, Abuja, February 23, 2011. In May 2010 Ibori was arrested in Dubai on an international warrant and eventually extradited to the United Kingdom in April 2011 where he was arraigned on money laundering charges. See Yinka Ibukun, “Nigeria ex-governor extradited to UK over allegations of stealing $292 million in state funds,” Associated Press, April 15, 2011. Statement by Nuhu Ribadu in the UK money laundering case against former Delta State governor James Ibori, August 26, 2009, p.6 (on file with Human Rights Watch). Human Rights Watch email correspondence with Femi Babafemi, head of media and publicity at the EFCC, Abuja, August 5, 2011. See Human Rights Watch, Chop Fine: The Human Rights Impact of Local Government Corruption and Mismanagement in Rivers State, Nigeria ; Human Rights Watch, Politics as War: The Human Rights Impact and Causes of Post-Election Violence in Rivers State, Nigeria. Human Rights Watch interview with Nuhu Ribadu, Abuja, August 18, 2006. Human Rights Watch interviews with lawyers and civil society activists, Abuja and Lagos, February 2011; EFCC “dossier” on file with Human Rights Watch. Attorney General for Rivers State vs. Economic and Financial Crimes Commission , Federal High Court of Nigeria, Port Harcourt Judicial Division, Suit no. FHC/PH/CS/78/07, Judgment, March 20, 2007 (on file with Human Rights Watch). Human Rights Watch interviews with lawyers in Abuja and Lagos, February 2011. See also Ndubuisi Ugah, “Keyamo Writes Waziri Over Odili,” THISDAY (Lagos), July 27, 2008. Hon. Justice I.B. Buba, Federal High Court, Port Harcourt, “perpetual injunction,” March 2008, on file with Human Rights Watch. See Chris Ochayi, “EFCC vows to arrest Odili,” Vanguard (Lagos), March 6, 2008. The EFCC amended its appeal in March 2010, but Odili later sought leave to join the proceedings as an interested party, which, according to one of the EFCC lawyers, has further stalled the appeal. At this writing, no date had been set to hear the appeal. Human Rights Watch email correspondence with EFCC lawyer (name and location withheld), July 1, 2011. US State Department, “NIGERIA: AMBASSADOR AND HOUSE SPEAKER DISCUSS ELECTORAL REFORM, EFCC, YAR’ADUA, EKITI POLITICS,” cited in WikiLeaks cable ID: 205795, May 6, 2009. In June 2011, just days after leaving office, Bankole was arraigned by the EFCC on corruption charges. See also “Nigeria’s former speaker pleads not guilty to fraud,” Reuters, June 8, 2011. Human Rights Watch interview with Rabe Nasir, Abuja, February 24, 2011. It should be noted, however, that some have criticized legislators such as Nasir and his counterpart in the Senate, Sola Akinyede, for failing to live up to their own responsibility to ensure robust oversight of the EFCC. Human Rights Watch telephone interview with foreign aid official who works on EFCC issues (name and location withheld), July 21, 2011. US State Department, “WAZIRI RESPONDS TO DEMARCHE ON GON BACKSLIDING,” cited in WikiLeaks cable ID: 166860, August 21, 2008, http://234next.com/csp/cms/sites/Next/Home/5682972-146/story.csp (accessed June 30, 2011). US State Department, “NIGERIA: BILATERAL RELATIONS POST-EFCC DEMARCHE,” cited in WikiLeaks cable ID: 170240, September 17, 2008, http://234next.com/csp/cms/sites/Next/Home/5682972-146/story.csp (accessed June 14, 2011). US State Department, “NIGERIA: FOREIGN MINISTER SETS UP SURPRISE ENCOUNTER WITH EFCC CHAIRWOMAN,”cited in WikiLeaks cable ID: 197256, March 17, 2009, http://234next.com/csp/cms/sites/Next/Home/5682972-146/story.csp (accessed June 14, 2011). Human Rights Watch interview with Rabe Nasir, Abuja, February 24, 2011. US State Department, “NIGERIA: NEW EFCC CHAIR AFFIRMS COMMITMENT TO FIGHT CORRUPTION,” cited in WikiLeaks cable ID: 157715, June 11, 2008, http://234next.com/csp/cms/sites/Next/Home/5682972-146/story.csp (accessed June 14, 2011). US State Department,“WAZIRI RESPONDS TO DEMARCHE ON GON BACKSLIDING,” cited in WikiLeaks cable ID: 166860, August 21, 2008. See Convention on Business Integrity, “Report of the Public Perceptions of the Anti-Corruption Agencies,” 2010, p. 28. See ICPC Act, sec. 45-48; EFCC Act, sec. 25, 26. See ICPC Act, sec. 44(2). The EFCC can however investigate a person whose lifestyle and property it thinks are “not justified by his source of income.” EFCC Act, Sec. 7(1)(b). See section below, An Agenda for the Jonathan Administration. Human Rights Watch telephone interview with Folu Olamiti, resident media consultant at the ICPC, Abuja, August 10, 2011. See also Appropriation Amendment Bill 2010. Human Rights Watch email correspondence with Folu Olamiti, Abuja,August 10, 2011. In April 2005 the ICPC arraigned former minister of health Fabian Osuji, former senate president Adolphus Wabara, and five other legislators on corruption charges, but in June 2010 the Court of Appeal dismissed the case. See Ise-Oluwa Ige, “N55m scam: Appeal Court frees Wabara, 2 others,” Vanguard (Lagos), June 2, 2010. In May 2010 the ICPC arraigned former chairman of the ruling People’s Democratic Party (PDP) Vincent Ogbulafor for allegedly siphoning off $1.5 million while deputy minister for special duties in 2001. See “Nigerian party chief pleads not guilty to fraud,” Reuters, May 11, 2010. In January 2011 the ICPC arraigned deputy health minister Suleiman Bello on corruption charges dating back to Bello’s time as the resident electoral commissioner in Adamawa State. See Kingsley Nwezeh, “ICPC Arraigns Health Minister, Bello, Ex-SSG,” THISDAY (Lagos), January 31, 2011. See also section above, Political Interference in Anti-Corruption Cases . See Innocent Anaba, “Ex-NDLEA chief, Lafiaji, aide jailed,” Vanguard (Lagos), June 22, 2010. Human Rights Watch interview with Sola Akinyede, Abuja, February 23, 2011. “How We Are Tackling Corruption in Ogun State—Governor Gbenga Daniel,” ICPC Monitor, March-May 2010, pp. 23-28. See Edegbe Odemwingie and Wisdom Patrick, “EFCC Begins Investigation On Obasanjo’s Petition Against Daniel,” Leadership (Abuja), April 29, 2011; Akin Oyedele and Ademola Oni, “EFCC traces £2.7m London property to Gov Daniel,” Punch (Lagos), August 1, 2010. See ICPC Act, sec. 3(4). Section 3(4) provides that “The Chairman shall be a person who has held or is qualified to hold office as a Judge of a superior court of record in Nigeria.” For a definition of superior courts of record, see ICPC Act, sec. 2 and Constitution of the Federal Republic of Nigeria, sec. 6(5). Constitution of the Federal Republic of Nigeria, sec. 271(3). See Abdul-Rahman Abubakar, “Senate rejects Jonathan’s nominee for ICPC,” Daily Trust (Abuja), February 10, 2011. President Jonathan nominated Francis Elechi as a second candidate for the post in May 2011, but opposition parties have opposed his nomination, claiming that Elechi is a member of the ruling People’s Democratic Party (PDP) with close ties to Rivers State Governor Rotimi Amaechi. See “ACN Opposes Nomination of PDP Stalwart as ICPC Boss,” Daily Trust (Abuja), July 12, 2011. See Oluwole Josiah and Toyosi Ogunseye, “Adoke knocks EFCC, ICPC at Senate screening,” Punch (Lagos), July 1, 2011. Human Rights Watch interview with Sam Saba, chairman of the Code of Conduct Bureau, Abuja, July 14, 2010. The Code of Conduct for Public Officers in the Nigerian Constitution requires all public officials, including all police officers, to file asset declarations upon taking office, every four years thereafter, and at the end of their term in office. See Constitution of the Federal Republic of Nigeria, 1999, schedule 5, part I, sec. 11(1). Human Rights Watch interview with Sam Saba, Abuja, February 17, 2011. The 2010 budget for the Code of Conduct Bureau was 918.2 million naira (approximately $6.1 million), while the budget for the Code of Conduct Tribunal was 335.4 million naira ($2.2 million). See Appropriation Amendment Bill 2010. See Constitution of the Federal Republic of Nigeria, 1999, schedule 5, part I, sec. 18(2) . See Constitution of the Federal Republic of Nigeria, 1999, schedule 5, part I, sec. 3. Human Rights Watch interview with Sam Saba, Abuja, February Abuja, February 17, 2011. The attorney general, Mohammed Adoke, later acknowledged that “[t]here was no substantial evidence to link him to the crime he was said to have committed,” and that the “general perception” was that Ribadu had been prosecuted “because he stepped on toes as the chairman of EFCC.” See Emmanuel Ogala, “Government had no case against Ribadu,” Next (Lagos), June 20, 2011. See text box above, Ribadu: Then and Now. The EU’s assistance was part of a four-year, $32.2 million project that was implemented by the United Nations Office on Drugs and Crime (UNODC). Most of the EU funds to the EFCC went to funding equipment, IT development, and training. See Claes Sandgren and Oladeji Ojo, “Mid-Term Independent Evaluation of UNODC Project NGA/S08: ‘Support to the Economic and Financial Crimes Commission (EFCC) and the Nigerian Judiciary,’” September 2008, p.10. See text box, An Attorney General’s War on the EFCC, and section, Allegations of Corruption, above. See Jeffrey Gettleman, “Two Sides of Nigeria Addressed by Clinton,” New York Times, August 12, 2009, http://www.nytimes.com/2009/08/13/world/africa/13diplo.html (accessed June 21, 2011). See section above, Allegations of Corruption. See section above,Allegations of Poor Leadership. See text box above, An Attorney General’s War on the EFCC. See Ebahi Ifidon-Ekuerhare, “Aondoakaa Chased Out of London Hotel,” Leadership (Abuja), September 20, 2009. See Yinka Ibukun, “Nigeria ex-governor extradited to UK over allegations of stealing $292 million in state funds,” Associated Press, April 15, 2011. Lincoln University, located in the state of Pennsylvania, also gave Peter Odili an honorary degree, held a luncheon in his honor, and named a building after him. In April 2008 Odili began a four-year term on Lincoln’s Board of Trustees. See Arvind Ganesan (Human Rights Watch), “Higher Education’s Dirty Little Secret,” commentary, Huffington Post, March 16, 2011, http://www.huffingtonpost.com/arvind-ganesan/higher-educations-dirty-l_b_836552.html (accessed June 29, 2011). See “Anti-Corruption: U.S. ‘Kleptocracy Initiative’ Boosts Transparency,” Revenue Watch Institute, August 6 2010, http://www.revenuewatch.org/news/news-article/united-states/anti-corruption-us-kleptocracy-initiative-boosts-transparency (accessed June 21, 2011). See US Department of Justice, “Assistant Attorney General Lanny A. Breuer of the Criminal Division Speaks at the Franz-Hermann Brüner Memorial Lecture at the World Bank,” May 25, 2011, http://www.justice.gov/criminal/pr/speeches/2011/crm-speech-110525.html (accessed June 21, 2011). See EFCC Act, sec 2(3). See ICPC Act, sec. 3(8). See EFCC Act, sec. 2(a)(ii). See ICPC Act, sec. 3(4). Human Rights Watch, “Everyone’s in on the Game”: Corruption and Human Rights Abuses by the Nigeria Police Force . Human Rights Watch interview with Auwal Ibrahim Musa, executive director of the Civil Society Legislative Advocacy Centre, Abuja, February 17, 2011. Constitution of the Federal Republic of Nigeria, 1999, schedule 3, part I, sec. 3(c). Human Rights Watch interview with Juliet Ibekaku, Abuja, February 24, 2011. See “ACN Opposes Nomination of PDP Stalwart as ICPC Boss,” Daily Trust (Abuja), July 12, 2011. See Nigerian Bar Association, “Reform of the Holding Charge Practice in Nigeria,” May 20, 2008, http://www.nbaprograms.org/papers.htm (accessed July 1, 2011). Justice Oyewole also presided over the $242 million Brazilian bank fraud case in 2005, the EFCC’s first major conviction in a financial crimes case. See section above, Background and Context. Human Rights Watch interviews with lawyers in Abuja and Lagos, February 2011. In January 2011 the Court of Appeal dismissed Olabode George’s appeal and upheld his conviction. See Innocent Anaba, “Appeal Court upholds Bode George, others’ conviction,” Vanguard (Lagos), January 22, 2011.